The picture at the top of the page (with the truck) is our 2010 New Horizons. The picture immediately above is our 2012 New Horizons with full body paint in Champagne. 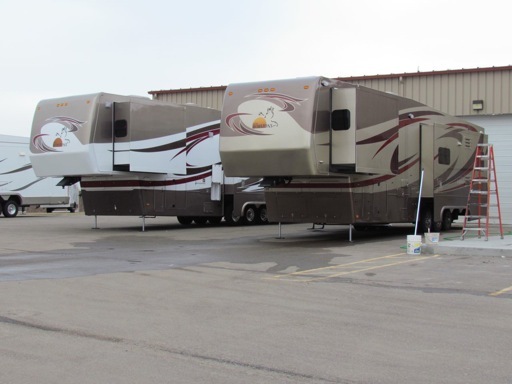 In late February 2010 we took delivery of a custom New Horizons fifth wheel. It was by far the nicest RV we have ever owned. We chose New Horizons after looking at all available luxury 5th wheels. We feel that on today's market it is the finest 5er available. In the Spring of 2012 we took delivery of our second New Horizons, a custom built 42.5' version of our 2010 floorplan. We sold that unit in 2014 and built our current coach - a heavily customized 2015. The 2015 is a 44.5' variation on our 2012 model. See the section below for 2015 information. There is a playlist of eight videos featuring the interior and exterior of our 2015 coach HERE. Photos of the Dinette and Entertainment Center are HERE. A video tour of the New Horizons plant - featuring our 2015 coach - is available here. It is about 30 minutes long. Why is New Horizons a "Better" RV? 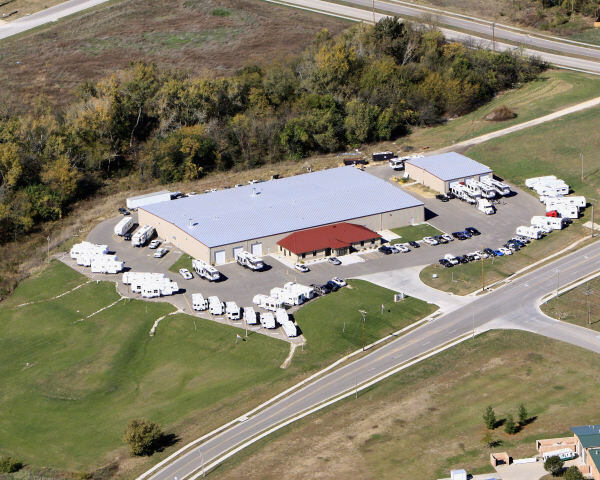 New Horizons RV is a family owned and operated company located in Junction City, Kansas. 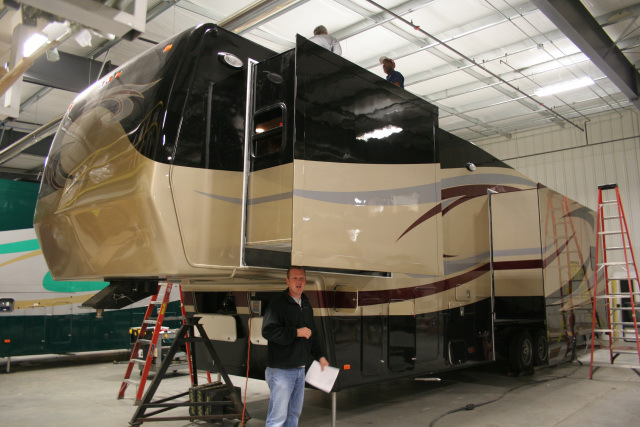 New Horizons builds custom 5th wheel RVs to order, and sells factory-direct to the end customer. There are no “stock” models sitting on dealers lots. Each and every 5th wheel is built with customer input, exactly the way you want it. Although this is not unique in the industry, it is pretty uncommon. Getting exactly what you want in a luxury RV makes building your “dream rig” not only possible, but easy. For over twenty years New Horizons has built quality RVs to customer order – so they know what they are doing. Phil and Karen Brokenicky acquired New Horizons in 2002 and immediately started expanding and improving the product line. The product line consists of three types of fifth wheels and a travel trailer. The original design is called the Classic, and is a more basic 96” wide model without molded end caps. This is the original design of the RV, and has been built for over 20 years, with a few modifications and modernizations along the way. Shortly after Phil and Karen took over the company they produced a newer version of the Classic called the Summit. This modernized the décor, added molded fiberglass endcaps, and some other technical advances – notably flush-floor slides. But it remained a 96” wide model. In 2010 the Summit was modified to include the ducted air conditioning that was developed for the Majestic line. As improvements from the Majestic line are "pushed" into the Summit it has become basically a "narrow body Majestic". You can build a Summit that has all of the luxury features of the Majestic, but on a frame that is more suited to a shorter coach. In early 2009 New Horizons began production of the prototype that was to become the flagship product line: the Majestic. This prototype was first shown at The Rally, in Albuquerque, NM in May of 2009. 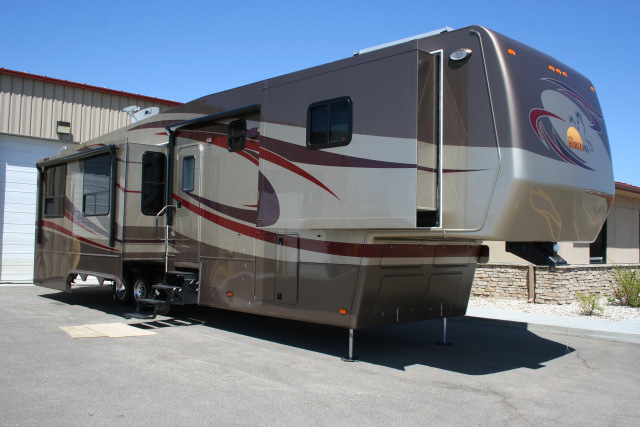 The Majestic was targeted at being the finest luxury fifth wheel RV on the market. With the demise of Teton and Travel Supreme the high-end luxury fifth wheel market needed a new RV to fill the void, and the Majestic does so nicely. The Majestic is a wide-body design, with fully ducted air conditioning and painted graphics – differentiating it from the Summit line. There is now a second version of the Majestic product line called a Majestic LM. This is a lower cost Majestic that deletes some of the standard features of the “full blown” Majestic. It enables one to get the Majestic advantages without all of the cost associated with building the fully-featured Majestic. Either the Majestic or the Summit line can be configured as a "toyhauler" - New Horizons calls a toyhauler a MotoMover. Since all New Horizons are custom units built specifically to the customers requirements you can configure your garage any way you like it. Side entry, rear entry, drive through, stackers, bunks, cabinets, hobby rooms, wash-down options, dog kennels, 50' units, or even horses. These units are FULLY custom, and your imagination is your only limit. To me, although we do not have a MotoMover, the thing that truly sets the MotoMover apart from the rest of the toyhauler units in the industry is that you have a luxury, custom RV up front. Most of the other toyhaulers on the market are - let me be gentle in my wording here - kind of "basic". Additional info on the various models is available on the New Horizons website. And New Horizons has a YouTube "Channel" with videos of their units, construction process, and other interesting info. After being fulltime RV’ers for ten years we knew we would never own a house (sticks and bricks) again. 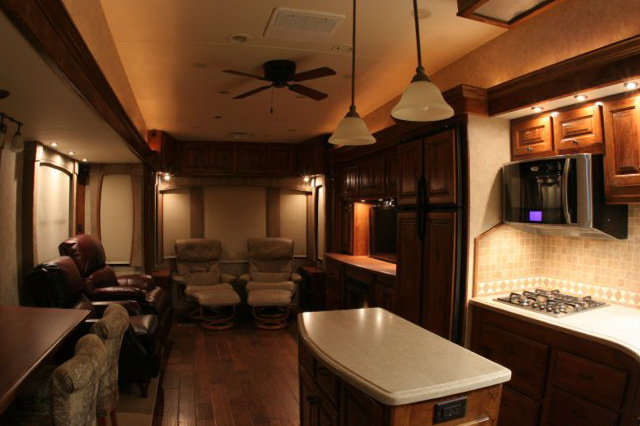 We always planned to one day build a customized Teton fifth wheel. We stopped at the Teton factory once a year for many years to learn all we could about them, and what we could do. We found that while Teton (in its later years) would “customize”, the amount you could change the product was somewhat limited. But we studied the possibilities; built out our order sheets, figured out how/what we wanted to customize, and waited…. We realized that the market was passing us by. Teton was increasing the prices at a rapid rate – to the point that we decided we would never own a new Teton; it was simply more money than we were willing to spend on an RV. We had always liked some of the features of the Classic New Horizons, but to be frank, they simply were not “current” enough for us in the décor and infrastructure features. Things like flat floor slides, gel coat exteriors, molded end caps, wide body chassis, and ducted air conditioning were required features – and available on competing fifth wheels for less than the price of a New Horizons. So, although New Horizons built a quality product it simply did not meet all our needs when we first started considering building a custom or semi-custom unit. When Phil and Karen bought the company and the Summit became available some of our requirements were met, but we still wanted a wide body unit, and ducted AC. 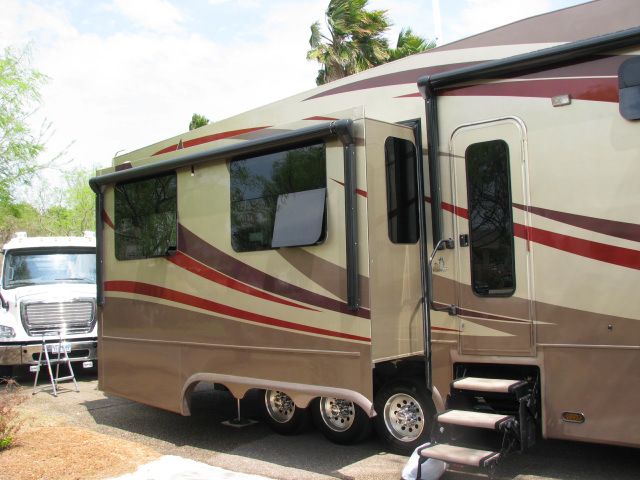 With the launch of the Majestic, we finally had our needs met in a true custom fifth wheel. But I was skeptical. Would it be the same high build-quality as the past New Horizons, and would the factory continue to do true custom builds or go the way of some of the other “custom” manufactures and only do semi-custom. And, most important, could we afford it? In the year before buying our New Horizons we had looked closely at all of the high-end manufacturers still in the market. The Doubletree Elite Suite, Mobile Suite, Excel, Spacecraft, Carriage Royals International (which we owned at the time), and the Newmar Kountry Air were all RVs we looked at closely and evaluated. None of them really met our needs well, and most of them were priced in a range that was higher than was comfortable for us in a “stock” unit. Doubletree would do some customization of their Elite Suite, and Spacecraft, of course, is a true custom builder. But the other manufacturers would do little or nothing to meet our specific requirements. While we did not look at them, Travel Units also builds a true custom rig. Once we looked at the Majestic prototype, saw the standard features, and found out it was still a true custom unit we decided it was worth a factory visit. We were impressed enough with what we saw at the factory to spec out a unit. With the economy as it was at the time, the price was right for us and we placed our order. The custom unit we built in 2010 was priced in the same range as the Elite Suite that we were looking at, once we optioned-up the Elite. While it may be spec’ed similarly, it certainly does not compare from a technical perspective – the New Horizon is a superior unit in almost every respect. And there are things in our New Horizons that DRV would not do. While that price comparison was valid in 2009 when we ordered, since then DRV has lowered the price of the Elite - to do that they took out standard features. Both an Elite and a New Horizons in the same size and with comparable amenities are expensive. As of 2012 the Elite Suite is the closest 5th wheel in the luxury class to a New Horizons. Compare the features and materials closely. A New Horizons costs more - but you get more for your money in my opinion. Nevertheless, a New Horizons is an expensive purchase - but you do get exactly what you want in a fully custom unit, with residential appointments, appliances, and fitment. Well, the first question is "Better than what?". I don't believe New Horizons has anything in it that is compellingly "unique". 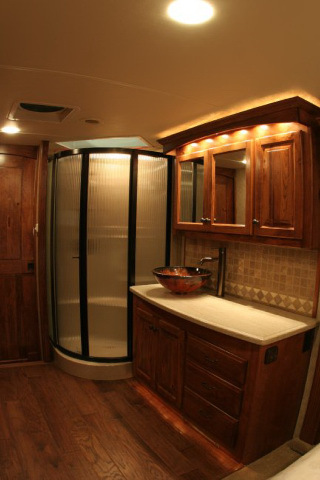 You can find most of the features, finishes and designs in another RV. With perhaps the exception being the quality of the cabinet work - I've not seen anything that compares to that in another towable RV. But otherwise, different RVs exhibit some of the characteristics of a New Horizons. The difference comes in how many of the higher-end features, materials and components are brought together in a New Horizons. 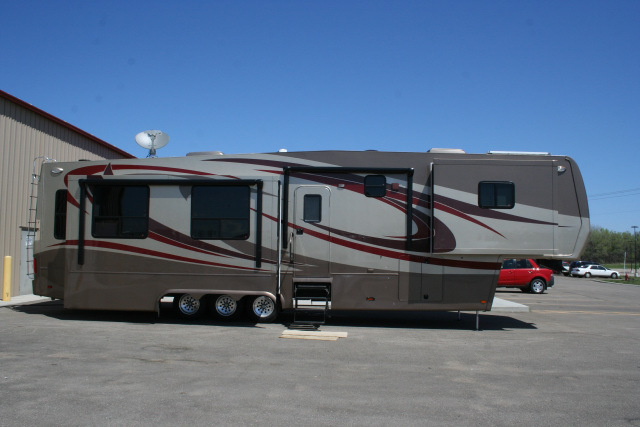 Plus the fact that it is truly a custom built RV - built to your requirements, and incorporating the materials you want. So, following are some of the things that I believe makes the New Horizons a "better" RV. And this is before any options or customization. Furniture-grade cabinets constructed with pocket screws, fully finished solid hardwood drawer boxes (not plywood), dovetailed corners, ball bearing (self latching) drawer slides. These truly are what you would see in a high-end custom residential application. No particle board or staples are used anywhere in the RV (…well, staples are used on the carpet…). No plastic “fake wood” trim or corbels around slides – all solid wood. State of the art, robust frame; 12” I beam on top of 4”tubing. Properly reinforced. Aluminum frame is available for weight savings. Best available “running gear”; three axles, Mor/ryde IS suspension, disc brakes, 17.5 H rated tires (on larger units). A minimum of 3,000 lbs carrying capacity, even on smaller units. On larger units up to 6,000 lbs carrying capacity. Quadra Bigfoot automatic levelers with remote key fob and “hookup height” memory. Fiberglass roof – one piece, no seams. 2x 40lb propane bottles with gauges on slide - a slide that actually works right. 12 gallon water heater with electric. Multiplex lights with two pad locations. Surge protector for 120v systems. Available ABS braking. The only in the industry. Laminated wall, ceiling and floor structure is exceptionally strong. Standard battery box can hold 6 batteries (or specify any size needed). Air conditioners have condensate pumps so no water dumped on roof. Largest basement height in the industry. Of course, along with the "better RV" comes a "better price". There is no denying that a New Horizons costs more than most production RVs. But you get more as well. Only you can make the tradeoffs required to decide if the superior infrastructure, quality and amenities are worth the extra cost. In our case, the RV is our only "house". So we are willing to pay a "little" extra for the "lot" of quality and amenities we get. Not everyone will come to that conclusion. Also, let me note that I'm not suggesting New Horizons builds "perfect" RVs. Although for the money some would think they should be. All RVs are hand built. All RVs have issues. See the Quality section for more of my "opinions". The sales process was interesting and totally different than working with a “dealer”. Since this is a family owned business, you have access to Phil (the owner). One of his son's - Cole or Drew - will assist you with the ordering process. Obviously, you are dealing directly with the factory – not a salesman employed by a dealer. And there is no question which is answered with “I’ll check on that for you”. Everyone knows what the factory is capable of, and they know how to get things done. Because you are building a custom rig you might specify things that they have not done before – these issues get resolved quickly, along with pricing. Their business model is “custom build”, so they know how to address these issues, unlike a traditional manufacturer. Here is how our order process went. We arrived at the factory in our Royals International on a Saturday. We plugged into their power and water behind the service center (they service all brands of towable RVs, and many things on motorized RVs). We connected to their wireless Internet for our “surfing pleasure”. On Monday morning we met with Phil for a factory tour. This took a couple of hours. We got to go inside any of the rigs under construction, and Phil answered all of our questions. Nothing I asked him stumped him – unlike other factory tours we have taken. Phil is clearly proud of the new, modern factory they built and he often does the tours himself. After the tour Phil asked if we were interested enough to spec out a unit. The only way to really know what “your” unit will cost is to actually spec one out – but I was hesitant to do this because we were pretty sure we could not afford what we would “want”, and I did not want to waste his time. Surprisingly, when I told him this, and that there was less than a 50% chance we would be buying right now, the answer was “No problem, this is the way we do business – we can spec one out so you can see what it would cost and what you would get for that”. So we did. And we held nothing back – we put on everything we could think of that we would want. This took the rest of that day for the initial “swag” at our trailer. At the end of the day we had basic CAD drawings, and a printed price list with everything detailed. But this was just the START. After considering the initial order sheet and pricing we decided to go ahead and order a unit. It took another two days to finalize our plans and all the details. Of course, we kept adding things so the price adjusted (upward) some. By Thursday we were ready to sign the order. While we did not work "all day" on the order each of those days, it does take some time to properly design the unit - depending on how much customization you want, and how much time you previously have spent thinking through what you might want in a custom coach. Don't cut your time short if you go to the factory to order. Of course, you don't have to go to the factory to order - they are very used to doing this from afar. But if you can get to the factory you will find it beneficial. On a side note, it is unusual for the CEO of a company - even a smaller manufacturer like New Horizons - to directly participate in the order process like Phil did with us. More typical would be to work with Cole, Drew or another Product Specialist. We were honored that Phil took the time to get to know us, and he is, of course, always available to any of his customers. The Majestic comes with many more standard features than most high line 5th wheels, so be careful when you compare. For example, Bigfoot (by Quadra) hydraulic leveling is standard on a New Horizons. This allows for bi-axis leveling with four hydraulic jacks. The rig is automatically leveled at the push of a button. The jacks can also be used to lift the entire coach off the ground, for tire changing or other situations where getting the wheels up is convenient. Like all modern coaches it has a wide body design. With its 6’8” bedroom one-level height it has more bed/bath headroom than any other 5th wheel. This makes it possible (for example) to delete the standard skylight in the shower if you wish, since there is enough headroom for most people. In other coaches, tall people need that skylight space in order to shower. Why would you want to do that? Well, the skylight lets in lots of heat and cold if you are not always in temperate climates. The front storage compartment (the “belly”) is very large – 42” tall gives you lots of room for items. 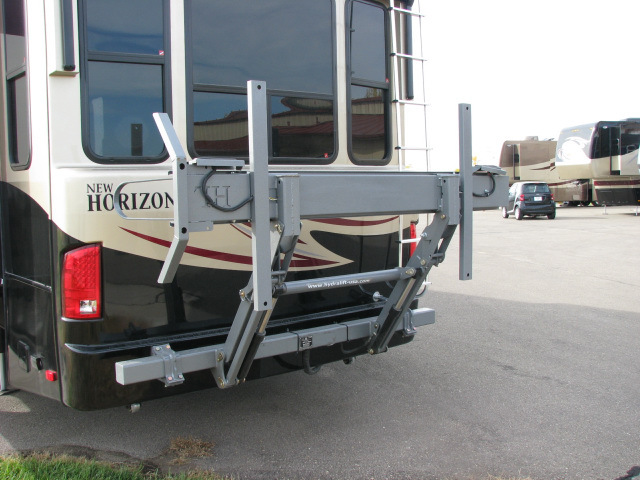 Unlike other RV manufacturers, New Horizons builds almost all the chassis components and interior elements in-house. Each frame is built from scratch specifically for the coach that you help design. So it is easy to add a foot (or two or three) to any area of the coach. Any special features that require frame modifications can be easily accommodated. Need a special ride height? No problem. Want the bedroom 2’ longer? No problem. Axles are positioned as appropriate for YOUR rig and its weights. If, for example you intend to carry a motorcycle on a rear lift, the axles will be biased towards the rear to account for the extra weight. From the beginning New Horizons has been well known for the quality of its cabinets. Until mid-2012 all cabinets were built in-house in their state-of-the-art cabinet shop. Starting in 2012 the cabinet doors and drawer boxes have been outsourced to a high-tech robotic factory. This has resulted in a superior door and drawer to what was seen in the past. 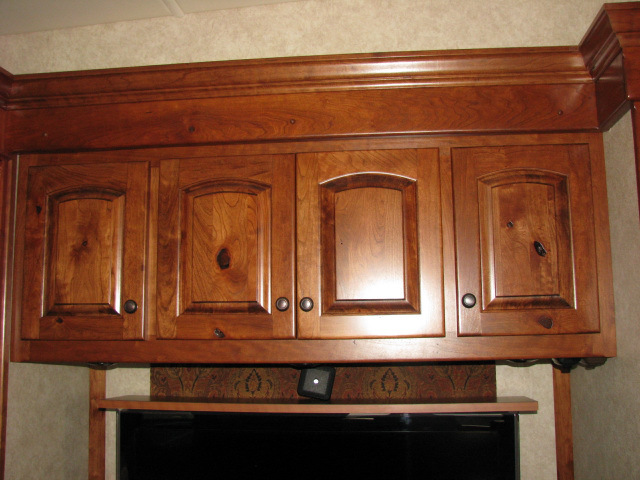 The quality and finish, as well as strength are far superior to most cabinets seen in RVs and rival high-end residential cabinetry. All cabinets are still custom to the rig being built - they are made to order. And there is still the ability to build cabinet doors totally in-house when appropriate - like for last minute fixes or changes. Frames are still built in-house. I was skeptical of this change since the New Horizons cabinets have always been a superior part of the coach - but I believe that the new doors are as good or better than what was built in-house. The pinch-rolled laminated exterior walls are constructed of blue Dow polystyrene (like that used in walk-in freezers) framed with aluminum. A continuous film of adhesive is used to bond the exterior surfaces to the aluminum and polystyrene, resulting in an incredibly strong structure. Just walk on the roof of a New Horizons and you will feel the difference from other RVs. This same technique is used for all sides of the slide out rooms - including the floors. This gives you superior insulation in the slide outs – uncommon elsewhere. In the picture to the left, that is an F450 using a wall section with no aluminum framing in it as a ramp. The main thing about the pinch-rolled walls is that the rest of the design does not negate the advantages of it. Electrical and plumbing is designed to NOT penetrate the exterior wall structure. Outlets are in cabinets or in corner chases in the slides. This way full insulation integrity is maintained, and more importantly, sources of draft are eliminated. This keeps the interior space especially comfortable. Mor/Ryde IS suspension – arguably the best suspension in the industry. We like it better than air suspension. Full-body painted exterior with two coats of clear. 40” Samsung 1080p HD TV with Denon surround sound A/V receiver and Boston Acoustics 5.1 surround sound. Double pane tinted windows (of course). These are frameless. Laminated, pinch-rolled exterior walls, roof, and floors provide superior insulation and draft free interiors. The slides are insulated in the same fashion. 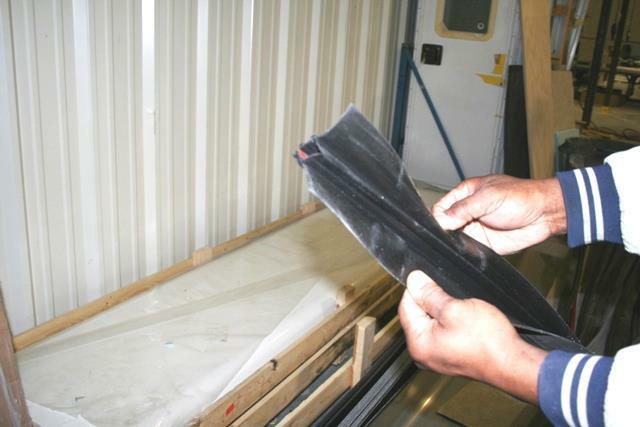 Did you know that on most other RVs that the slide floors are not insulated? 70 gallon black tank. This tank is specially constructed with a sloped-to-the-outlet floor, and the outlet is actually set lower than the bottom of the tank. This assures full drainage of the tank, unlike many other vendors black tanks where the outlet is actually 1/4" to 1/2" above the floor line. The black tank washout is not a single spray device like on most other rigs – the black tank has a tube that runs into it that has multiple spray outlets on it. This significantly improves the cleanout. Frameless windows are a no-cost option. Your choice - framed or frameless. The Quadra Bigfoot automatic levelers have been upgraded to use a system with a key fob remote. The system also remembers where your trailer hookup point was, so it is easy to get back to that for hooking up when you leave. If you order just a cook top (no oven) then the Verona residential cook top is standard. Shown is the black Verona in an extended-counter kitchen (in a 48' unit) with doors under (with rustic cherry wood cabinets). Two drawers are standard under the cooktop. Normally, you would only have a few inches to the left of the cooktop - the size of this particular unit allowed the kitchen to be extended. Tile-work edges are now tile pencil trim instead of wood. This is a much nicer look, in my opinion. The cabinet drawers have been totally reworked. They are now maple boxes, with dovetailed corners, totally finished with poly. This is an outstanding drawer box. Actually better than a high-end residential kitchen cabinet. It is hard to believe that New Horizons could improve on their cabinets - but they have. The roof is upgraded to 4" of blue Dow polystyrene (two 2" layers). This is up from the two 1.5" layers previously used and brings the roof to an R-25. The AC ducts have a full 2" of polystyrene on top of them. This is very effective in keeping the air cool and adds to the AC efficiency. Air Conditioners are switched to Coleman. The new model from Coleman is a quieter AC unit, and it has higher volume airflow that the Dometic (or the original Carrier units). It is substantially quieter. The air conditioner ducts are re-profiled for better airflow, thus better cooling, and a quieter interior. They are not quite as "flat" as they were, since the thicker roof allows for a taller profile. This was designed in conjunction with the Coleman AC engineers to maximize the effectiveness and quietness of the new Coleman AC units. Fully ducted return air for the air conditioners also results in a quieter interior and more efficient cooling. Air conditioner condensate will be collected via a captive system where condensate is collected by the AC unit and then pumped via a closed-pipe system within the roof and down the inside of the back cap to the ground. (The pipe goes down between the back cap and the rear wall.) The result is that in warm climates where you use the AC a lot you will not have condensate collect on the roof and/or run down the front/rear caps. This is a closed system directly integrated into the AC unit, so there are no issues with clogging, and nothing is visible either on the roof or within the rear cap. There are new slide seals with double wipers. These also have longer wiping faces so they are far more effective at both sealing and wiping. The entry door has been totally re-worked. There is now a black screen door and the main door trim is black. This better coordinates with the rest of the coach; especially if you have the new black frameless windows. The inside portion of the door is also covered in the same padded vinyl material as the inside ceiling headliner. As an industry first, you can get Anti-lock brakes on a New Horizons. Tuson is the supplier. It does require that your tow vehicle use their proprietary controller - the entire system is called DirecLink. You can see a YouTube video here. There are at least four videos in this series....look at the other videos from them as well as this one. Wall insulation values are increased to R-14, and the floor is R-28. Various features and changes are made during the model year, as well as introduced for the new model year coaches. Some of the features I've listed below are actually changes that were introduced late in the 2012 model year production, but have not been documented elsewhere. New Horizons constantly includes improvements in their production run; they do not always wait until the next model year. Items listed here are (of course) subject to change/improvement and are available on units after the 2013 "show model". The water and sewage hookup centers are combined behind one long door for ease of access. The sewer area is divided from the water area internally for safety. If the optional powered water reel is ordered it is also behind this central door, along with sewer hose storage tube(s), an isolated storage area for sewer adaptors and parts, water hookup bibs and flush bibs, tank flush valves, fresh water tank fill valve, etc. All behind one central door, lower in the skirt so as to not "waste" space in the floor area of the coach. This area is heated. A grey water flush is standard, along with the existing black flush. There is also a single knife valve where the sewer cap goes on. This protects against a "surprise" when removing the sewer cap if a valve is leaking at the black or grey tanks. Upper cabinets now have an arch in the raised panel. 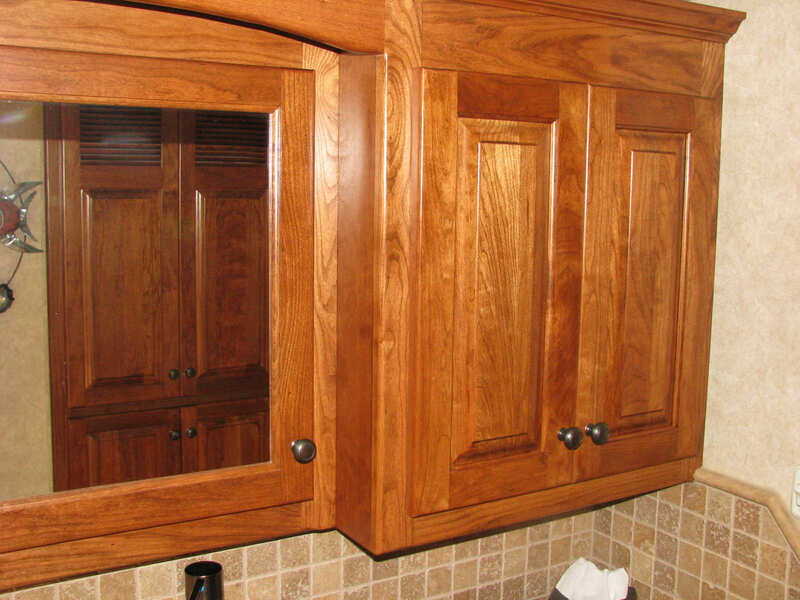 All cabinet doors have a "table edge" edge profile instead of a round-over profile (not shown in this picture). These changes dress up the cabinets quite a bit. The bathroom medicine cabinet has been redesigned on coaches with the larger bathroom. There is a 9" deep cabinet on the right side of the medicine cabinet that gives far more storage. 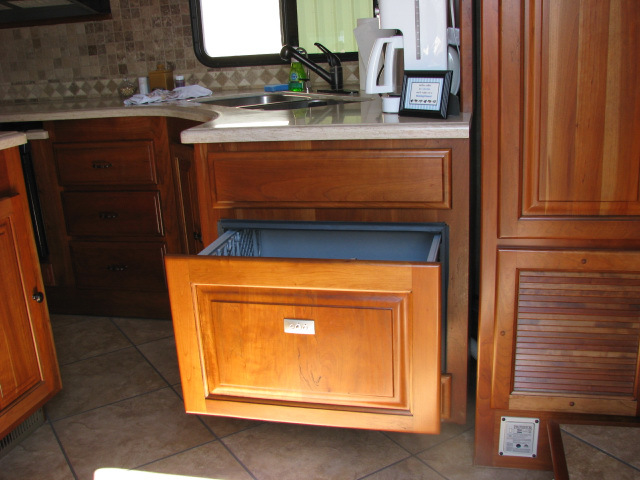 On our 2012 coach (shown) we put an electric outlet inside this cabinet for our electric toothbrush, and we had the countertop outlet mounted under the cabinet instead of on the tile surface - we think this provides a "cleaner" look. 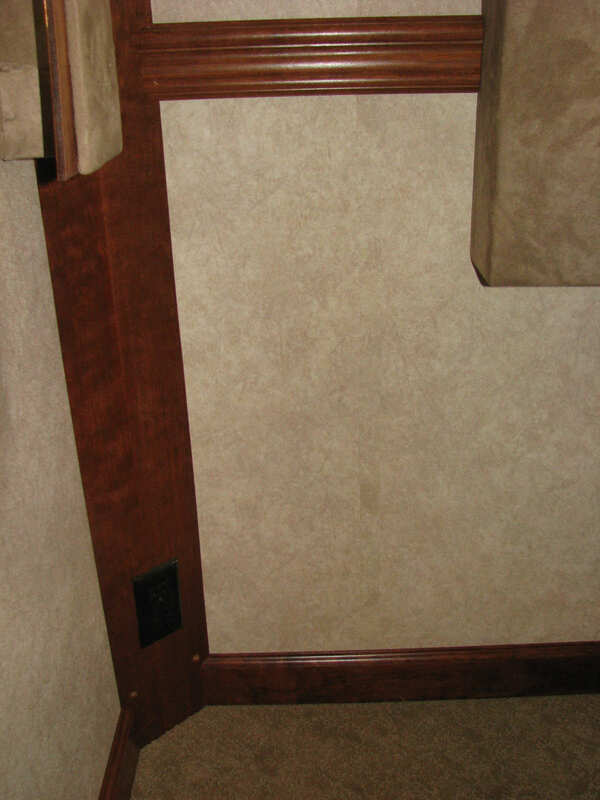 There is baseboard trim throughout the coach, with optional chair rails and wainscoting or raised panels. The wallboard is available in two colors and is used in conjunction with the wainscoting to create a very elegant look. The first picture shows simple baseboard and chair rail. You can also specify raised panels between the chair rail and baseboard - shown in the album here. All halogen lights are replaced with standard LED lighting which is dimmable. The "ceiling of light" (florescent) over the kitchen area is deleted and replaced with standard pendent lighting over the island, and an extra in-ceiling LED light. The pendants are mounted from a wood medallion on the ceiling. Floor lighting in the bedroom, steps, toilet room and bath area are LED. 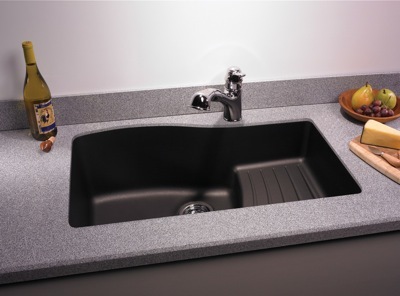 The new sink with Corian counters is an under mount quartz sink in a dark brown color (replacing a stainless steel sink). If you order optional granite that comes with a standard stainless sink. The tumbled marble backsplash is redesigned in a larger 4" tile, with accent tile inserts. The picture shows the standard Verona residential 4-burner cook top in black with the new tile. Stainless may be used as well, depending on availability. Granite countertops are optional. You can also use granite on the entertainment center top, the bedroom end table tops, the bedroom vanity top, and the bath countertops. 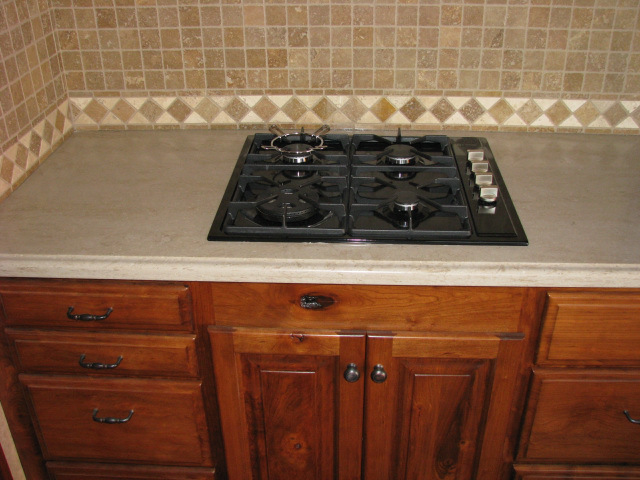 The lighter granite is used on the kitchen countertop and island countertop - the darker color is used everywhere else. Shown with the granite are the new wall covering styles. A Denon audio/video receiver is standard, along with Boston Acoustic surround sound speakers and powered subwoofer. This is a true A/V receiver, unlike the previous Samsung "surround" receiver. All components are selected from, and routed through, the Denon. The optional exterior entertainment system is moved from below the dining room window, to inside the main storage compartment. The slide hydraulic pump/manifold have been moved from the front storage compartment (above the genset) to the skirting area just in front of the entrance door. This frees up storage space in the main storage compartment. The generator (if optioned) is behind the fresh water tank under the living area. This frees up the generator compartment for additional storage. 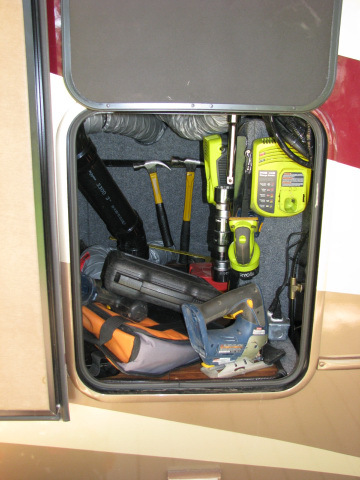 There is lots of space to access the generator and perform maintenance. A low profile 13.5 btu Coleman air conditioner (the MACH 8) is used in the bed/bath area (upper deck). This brings the overall height of the coach down several inches. See the Towing section for some discussion of coach height. In the toilet room, the fan is replaced with a MaxxFan with wall controls. The wall controls simplify use and convenience. This fan has an integrated rain cover and can be fully utilized in rain. An additional large storage compartment is available under the toilet room. This provides quite a bit of additional storage even though the sewer line from the toilet goes thru the space. In smaller coaches this is standard, on larger coaches it is optional. It is a perfect place to put two whole-house water filters. You see mine on the left, full of tools. It is about 3' deep, but can vary depending on the coach. The bedroom end table tops now "wrap" forward and around the slide trim. This provides for far more usable space and is a nicer look - especially in granite. Reinforcement and structural changes have been made to the frame. Additional gussets have been added to the upper deck, and the C-channel upper deck main members have been changed to box tubing with 1/4" walls. See the Frame section for more discussion. Questions about insulation are common. New Horizons uses high density blue Dow Corning polystyrene throughout the coach. This is one of the best available polystyrene products on the market - and has better insulation properties than the white polystyrene some other manufacturers use. 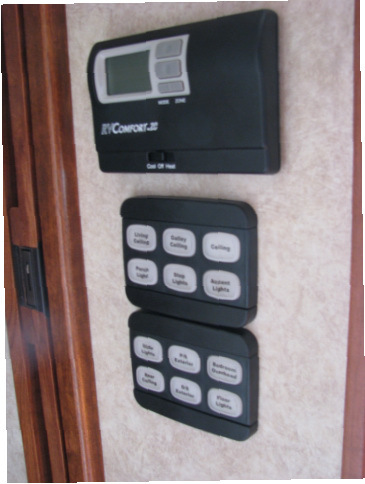 There is lots of discussion about the "best" way to insulate an RV. Many manufacturers use either wool or fiberglass batt insulation - like that used in a house. The claim is that it is "residential" so it is better. But consider that a house does not move down the road. The issue with batt insulation is that it can sag and pull loose over time, no matter how it is installed. This compromises the insulative properties of the batt. This is a common problem noted on DRV coaches. Batt insulation is also more prone to permitting air infiltration than a laminated polystyrene structure. Laminating the walls, ceiling and floor results in a structure that is both strong and impervious to air infiltration by its nature. One of the biggest issues with using batt in an RV wall is wall size. RV walls are not the thickness of residential construction, and compressing the batt results in considerable loss of R-value. So an R-14 batt compressed beyond its specifications is not performing at an R-14 value. Air infiltration is really more of an issue in comfort in an RV than the max R-value of the insulation. R-value alone is not sufficient - you have to also make the coach "breeze free". Every hole cut in the structure is potential air infiltration. Use of double pane frameless windows helps a great deal, since sliders never approach the performance of frameless windows. Consider the fact that the frameless window is closed down onto a seal. A slider runs in a track with "hair like" bulbs providing the only seal in many locations. I can tell you from personal experience that the frameless windows perform at a level above sliders, are easier to keep clean, and allow as much air circulation when used with a fan. They are also a superior look. The New Horizons lamination process is complimented by not cutting holes into the walls unnecessarily. All electric and plumbing is run in chases - not cut into the wall. Outlets are placed in built-out corners, or in the underside of cabinets, instead of in walls. Also, the lamination technique eliminates much of the aluminum wall studs, while enhancing strength, thus minimizing cold conduction into the interior. New Horizons maintains insulation properties in the floors of their slides. They are constructed with the same lamination process as the walls. 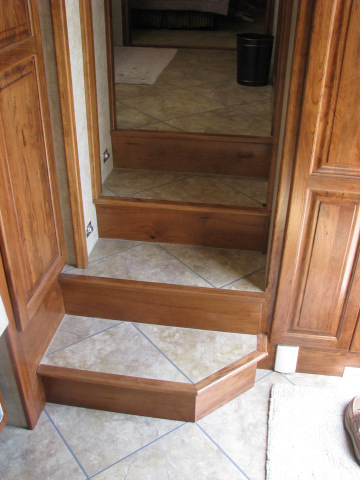 Some other RVs greatly compromise the insulation in the slide floors, or in some cases have NO insulation in the slide floors. The roof is R25 - it contains two layers of 2" foam. All the supply AC ducts have 2" of insulation on top of them, to minimize heat intrusion from the roof into the ducts. This enhances the performance of the air conditioning units and in hot weather provides a noticeable difference in interior comfort. The walls have 1.5" of polystyrene and are around R14. The floor is R-28. It consists of the laminated structure with 5/8" single sheet birch plywood on the interior (with no seams), polystyrene insulation and a heated tank space. Below that is more insulation with Astrofoil. This a proper use of Astrofoil. Astrofoil requires air space to obtain the most in insulation - compressing it in walls is not an optimal use of it's properties. 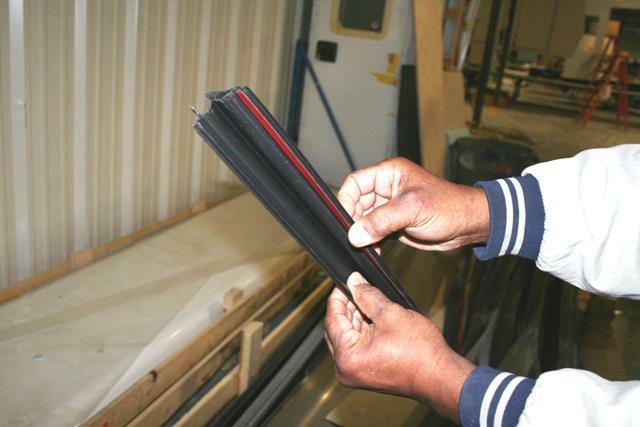 Along with the windows, an important factor in minimizing air infiltration are the slide seals. The triple slide seals on the New Horizon greatly reduce air infiltration. But there is still some. In my opinion, it is less than most other RVs in the industry. I'm very pleased with the performance of our 2012 coach. It is warm, and it has virtually no inside air movement in windy conditions. It is far better than other RVs I have owned, or been in. Is it perfect - no. But it is very comfortable even in cold conditions. We usually only heat with the fireplace until we are down in the low 30's for a longer period of time. I get a lot of questions about the frame structure. To the point I wonder why people are "frame obsessed".....I suppose it has to do with all the issues manufacturers have with their frames. There are lots of cracked or damaged frames in the RV industry. There are also many slide and leveling problems induced by less-than-robust frame structures and designs. One of the easiest places for manufacturers to save money (or increase their margin) is by cutting costs on the frame. The frame is obviously made of steel, good frame structures are expensive to build, and there is little design savings - the cost of the steel is substantial and relatively fixed. If a manufacturer wants to save money, it is tempting to do so in the frame. So I suppose I do understand why some are obsessed with the frame. New Horizons builds their frames in-house (with the exception of the aluminum frame, which is designed for the specific coach in-house but welded to-order in a specialty frame shop). Each frame is custom built for the particular coach that the customer designs. The frame on the Majestic is claimed to be the best in the industry; other manufacturers also claim this, and it is a hard thing to prove. But the Majestic frame is certainly one of the best in the industry, if not the best. It is based on a 12" I-beam structure. This provides the best vertical load carrying capacity of a single piece of steel. 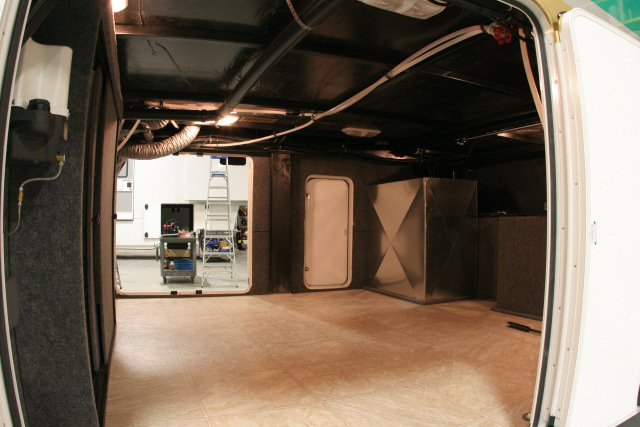 It allows for the large frame structures that custom RVs like a Majestic often require. There is a reason why bridges are built from I-beam based designs. They are superb at weight carrying. Take a look at the Hydralift on the back of the New Horizons to the left. This lift itself weighs around 500 pounds. It is rated for an 1100 pound motorcycle. (It is shown in its "stowed" or folded position.) 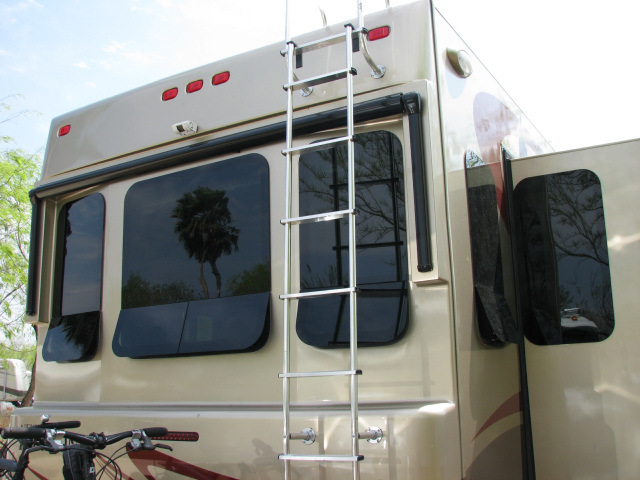 This lift simply bolts onto the RV. No frame modification is required. Don't try this with your average RV! By the way, the Trike lift would also work fine. 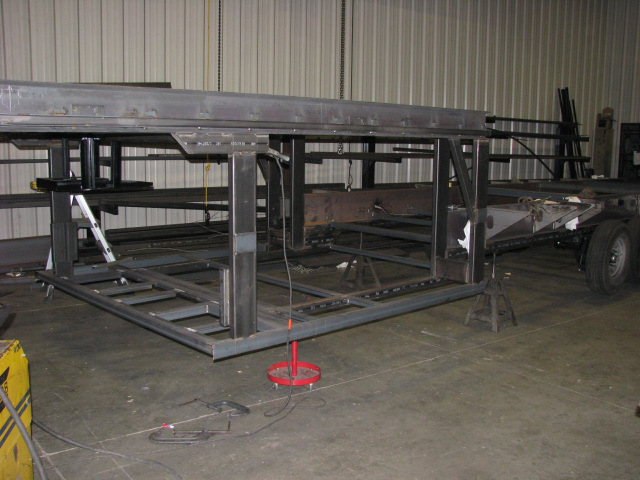 To augment the 12" I-beam, New Horizons uses a 4" box beam (tubing) welded to the underside of the I-beam. The purpose of this it to provide a basis for the "ladder" structure that provides lateral rigidity to the frame. 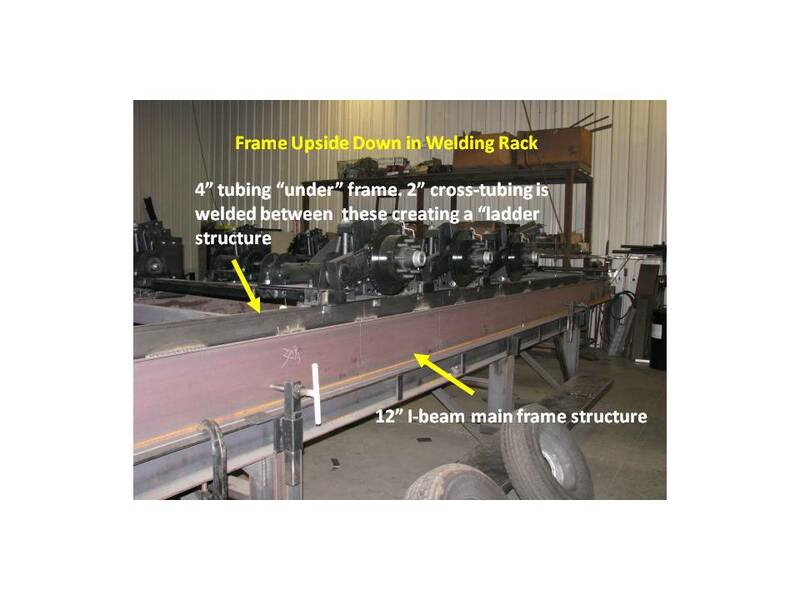 The 4" tubing under both sides of the beam are cross-framed (joined together) with 2x2" tubing to form a "ladder" structure, and the entire "ladder" is welded to the I-beams. This provides great rigidity to the frame as well as enhancing the vertical load carrying capacity. The total vertical "beam" height is thus 16", made up of a 12" I-beam and a 4" tube joined as a single structural component. So, why not "C" channel or a box beam (structural tubing) for the main support structure? 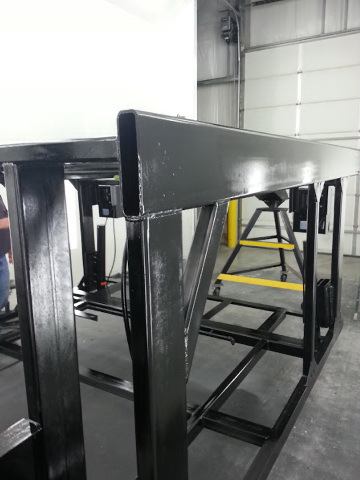 They are simply not as strong for the same amount of steel, and when building a custom coach at up to 48' you want the additional strength of the I-beam. Using the beam/tubing combination gives you the best of both products attributes: great lineal strength from the beam, and great lateral stability from the tubing. For the long runs cantilevered to the rear from the axles on larger RVs that is what you want. It costs more, but it works better. The upper deck (bed and bath) is also supported by 1/4" wall box tubing (picture below). Another frame-related question I get a lot is how are the slide rails and hydraulic rams related to the frame. As is common in the industry, these penetrate the I-beam. Some think this is a structural flaw, but one of the virtues of using I-beams is that this does not weaken the vertical structure when properly reinforced. New Horizons reinforces each penetration with a substantial plate welded to both sides of the I-beam around the penetration. This results in no structural weakening of the I-beam. With an I-beam - unlike a C channel or tubing (sometimes called a "box beam" by marketing departments) - you can do this. 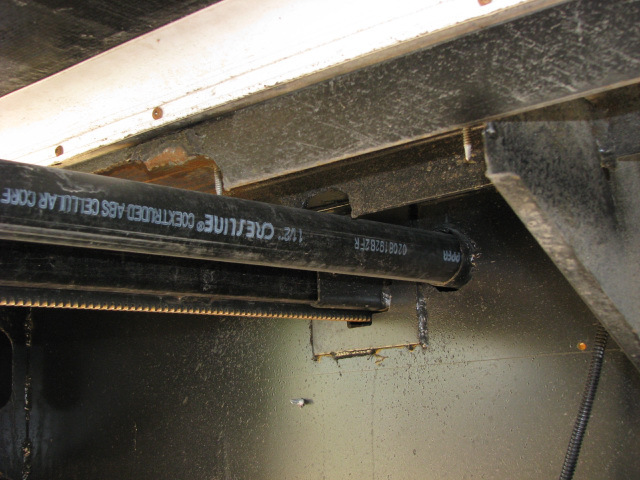 That is why I-beams are often used in quality RVs. In pictures to the left you can see the slide arm; the hole next to it is for electrical lines in the slide. They are in a tube to protect them and for a neater appearance. The picture to the left shows the bed/bath area looking forward from the entry door area (upper deck). There is an album with additional pictures of some frames here. There is commentary on the pictures. The graphics on all Majestic's are painted on, and then clear coat is applied over top of the entire rig - including the white gelcoat. Until February 2011 that was all done in-house. Now, the paint for all units is outsourced to Carrera Designs, Inc in Forest City, IA. This provides for a superior result - CDI is well known for the quality of its work. They paint for Excel, Spacecraft and Winnebago, among others. As of 2012, with CDI now painting the rigs, the paint has been upgraded to two coats of clear over full body paint (with an additional two coats of clear an option). As an option, the graphics can be "wrapped" around the sides of the slides. You can see that effect on the Majestic without the full body paint in the top picture. Note how the darker brown and the maroon stripe wrap the side of the bedroom slide. The full body paint Majestic next to it does not have the optional graphics on the bedroom slide - but it does have the base color on the slide ends. The picture of the black/gold full body paint is a 42' unit with rear kitchen. It has the paint wrapped around the slide ends. If you would like to download PDFs of the various body designs/colors these PDFs will show you the official layouts. They are all over 1MB downloads. Note: the floor plan shown is our 42' unit. We started with the 39' floor plan, and expanded it in the areas that suited us. We did not customize our rig as much as some people do. We have seen many examples of 100% customization of a Majestic – ours is based on a standard floor plan (the 102-39RLTSS) walk-thru bath model with three slides. We did not add the fourth slide in the bedroom, since we felt we did not need the extra walk around space, and it greatly cuts into the storage. If you plan on the 4th slide you need to fully understand the ramifications on bedroom storage. The 39RLTSS had the layout we prefer, but not the space (length). 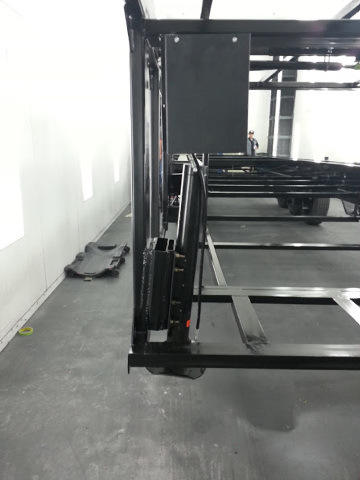 Thus, many of our customizations were based on stretching the rig and filling the additional length. The standard model is 39’ long; we added 2’ to the bedroom/bath area, and 1’ to the living area. We reduced the bath sink/vanity area to 36” wide, and added a 19” full-height closet next to the sink. 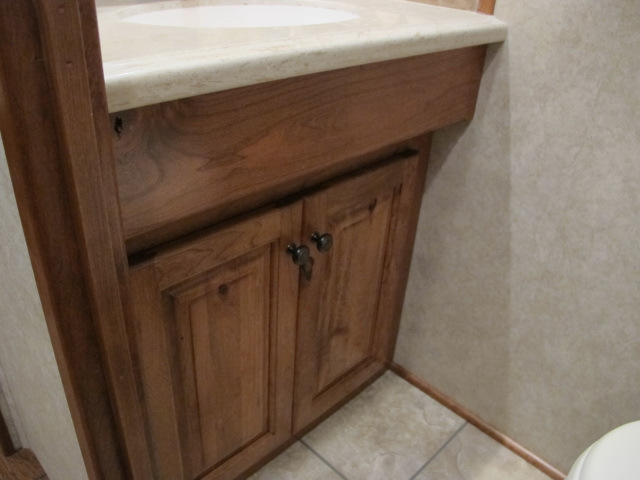 The 36” vanity is sufficient, and the closet gives us far more usable storage than a comparable wider vanity area would. This works for us, but many people would like the extra-wide vanity area. We deleted the second sink/vanity in the toilet room and replaced it with a full-height linen closet with shelves. The closet is divided into two sections and accessed from the toilet room. Accessing it from the sink area would have required slide-out shelves to fully utilize the space – and that would have wasted additional space and taken away a wall area in the main room. On that wall you can put towel racks, or decorative items – we have a wall sculpture hung there. The wall of storage in the bedroom (where the window and cabinets are) is much longer. It provides significantly more clothing storage that the shorter bedroom. Putting this area in a slide cuts the space quite a bit, so we did not consider the fourth slide (second bedroom slide). There is sufficient “walk around” room without another slide. For us, anyway. Additional floor lighting at the base of the cabinets across from the bed. This allows us to see the dog at night, as well as making it easier to get to the toilet room in the dark. I put red LED lights in these. That cuts down on night blindness from white lights. We had cabinets built above the bed instead of decorative shelves. A custom headboard was built with fabric inserts (neutral). We can change the décor in the bedroom without worrying about matching materials. The standard all-wood headboard also allows for changing décor easily. We had outlets put in the lower bed “box” so items on the bedside tables could be plugged in without unplugging them when the slide is brought in. It also provides a place to plug in electric blanket, if desired, or an air mattress. To maximize under bed storage we did not put drawers under the bed. Some people do that, and it does make access easier. We would rather maximize space. We added an outlet alongside the sink. We should have added two. We also added an outlet alongside the bedroom vanity (at the foot of the bed by the escape window). We had a lift-top vanity area made in the wasted space under the bed-vanity top (under the escape window). This stores random junk. We put in the 39” granite-finish shower. The 39" shower is standard - but we added the granite finish, which does not show spotting as much as a plain finish. Added the designer-bowl sink (vessel sink) with the tumbled marble backsplash. Splendide separates washer/dryer. We LOVE our washer/dryer. It is always a tradeoff on storage or washer/dryer, but in a rig this size we do not really sacrifice much storage. We have empty space! Doing it over again, I would seriously consider a propane dryer instead of the 120-volt electric dryer. It would be more efficient. They do not use much propane, so that is not a consideration. We are very satisfied with this set-up, though. The dry time on a full load of T shirts and 2 pairs of jeans is 100 minutes. That seems long if you are used to residential dryers on 240 volt service, but it is actually pretty good for a 120 volt dryer. The sink and tumbled marble backsplash were options. The granite-finish shower was an option. The changes in the living area were again driven by the one foot stretch. The stretch here was caused by the desire to have a larger entertainment center to fit in a fireplace and flanking file drawers. In order to make the area look “balanced” with the file drawers we wanted to stretch it some. In hindsight we would do things a little different and likely stretch the living area two feet, instead of one. The entertainment area was totally redesigned by Danielle. She stretched it 1’, added a window in the center, put the standard 37” TV on a lift instead of behind doors (in order to have the window), and put a fireplace in front of the TV. She flanked the fireplace with four file drawers. In hindsight, we should have left out a file drawer and replaced it with some smaller drawers. We should also have put a small full-width drawer over the fireplace. Although that would change the “look”, it would be worth it for storage of small items. We added an extra outlet in the top part of the entertainment center. We should have added one in the middle cabinet, where we ended up placing our multi-function printer, but it was easy for me to drill a hole through to a side cabinet. We also should have added an outlet to each of the side cabinets as well. The reason for adding an extra foot (over the one we did add) would be for furniture placement. We deleted all the standard chairs/sofa and bought Lazy Boy furniture. The couch area at the back of the rig (in the back window area) is only deep enough to take a 39” couch (for slide clearance). This is a very difficult size to find. We ended up with a Lazy Boy sleeper, which is nice, but adding 6” to this area would make more standard furniture available. The additional 6” would go into the entertainment center, and across from it, the seating area. Adding 6 more inches to the entertainment center would enable putting in a 46” or larger TV and still maintain the side cabinets for the “furniture look”. This would bring the overall rig size to 43’. Note: once you get over 38’ or so, the additional length does not really affect where you go much. We added a larger (deeper) custom sink. This sink is now standard. Whirlpool Velos convection/speedcook microwave. This works great and we do not need an oven with it. Dishwasher drawer in place of the oven. This is one of the best things we added, other than the washer/dryer. It uses 1.9 gallons of water to wash a load. I use more than that in the sink, washing by hand. I know, because I measured it. Ours is under the cooktop, where the oven would be. An alternative location is at the end of the counter to the right of the sink, facing the exit door. This frees the entire area under the cooktop for large drawers. This is perhaps a better use of space. Tumbled marble backsplash. 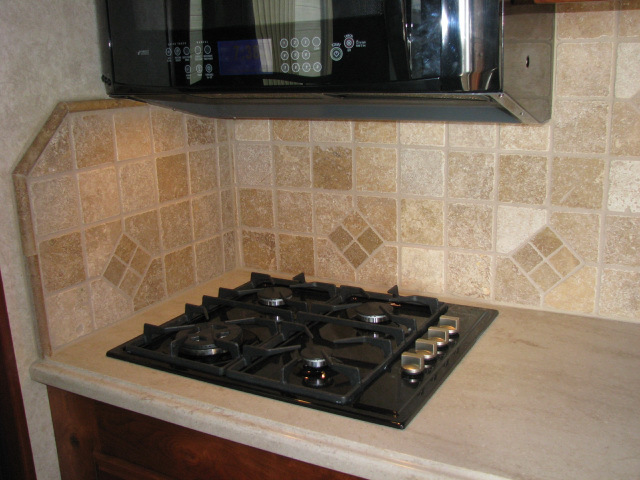 This is a very nice looking backsplash and does not collect grease or cause cleaning issues. Bronze fixtures and hardware throughout the rig. MCD motorized night/solar shades on every window in the living area, with manual solar shades throughout the rig. The bedroom night shades are manual. They are easily reached on the three windows in the bedroom, so motorized shades would be a waste of money in our opinion. I had an extra outlet and 12-volt power added to the upper cabinet by the door. I put all our communications equipment there – cellular router, amplifier, wifi extender, Ethernet switches, NAS, etc. I also had the rig wired with Ethernet cable from this point outward. Ethernet is on the roof (for wifi extender), in the outside utility cabinet, and over to the entertainment center. All of this “stars out” from the coat closet “communications area”. In retrospect, I should have put an additional Ethernet line over to the seating area. I can easily add this, though. The standard refrigerator is the new Dometic 12.3 cf RV refrigerator. We deleted the icemaker. This gives us a lot more room in the freezer. I have to say I am impressed with this new refrigerator – it works flawlessly, and keeps ice crème solid. We considered a small residential refrigerator, but we boondock enough that it would not be as practical for us. In the lighting department we added a few dimmers and the kitchen “ceiling of light” large florescent fixture, but other than that we have standard lighting – which is excellent. I recommend that the lights over the couch be on dimmers, though. We put in the Winegard Trav’ler open-air HD automatic rooftop dish to provide HD service for our entertainment center. We use DirecTV, but it is available with either service. This is the best dish available, in my opinion. And well worth the money. We have the optional coffee table, and three end tables (two are standard). Two end tables flank the couch, and one is between our Lazy Boy recliners. I’d like to get a custom end table between the recliners to better utilize the space and create more storage. Some people have built fixed cabinets flanking the couch, and this is a good option to consider. I’ve lumped together all the chassis, systems, and exterior stuff under this category. We made a bunch of changes here, some of which I would not do again, and some things we would add that we did not. Maybe we will build another rig….anyone want to buy this one? Seriously - I'll make you a deal on a custom rig with or without my truck that you could not buy a new one for even close to. We tow a Jeep Wrangler behind the 5er. So we had a number of things done to make this as safe as possible, and for our convenience. o We put on a BluDot brake actuation system, since we have an air-brake truck. This is an air/hydraulic system integrated with the truck airbrakes. It is the system used on semi-trailers and is a true proportional system. The two units act as ONE. This is not something that New Horizons has done in the past, so I went up to the factory to train their technicians in the installation process. I worked with them for a week on my rig on the BluDot and some other electrical items. o An external camera looking down on the Jeep. I provided the camera and they ran the wire to the hitch head. If I did this again I would likely put two cameras on the back. One to look down on the Jeep, and the second to look back down the road. 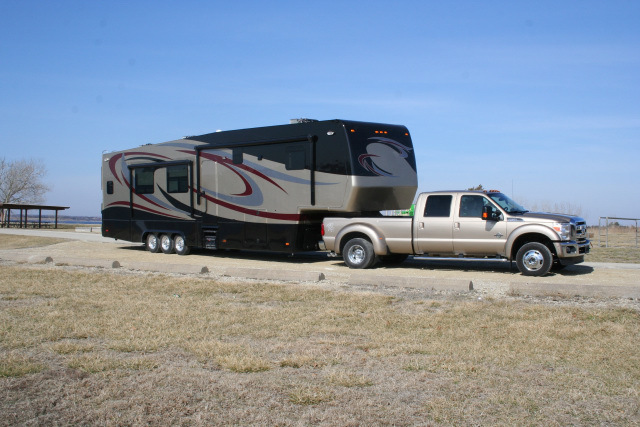 It is convenient to see vehicles that are close to the back of your RV. I would also consider a right side camera. o Auxiliary 7-pin connectors on both sides of the hitch at the rear. I should have had one wired as 6-pin. I changed that myself. So I have a 6-pin connector as well as a 7-pin. This was probably “overkill”. A 7-pin to 6-pin converter might have sufficed. o A separate wire bundle (7 wires) for auxiliary functions goes from the hitch area at the rear, to the hitch head at the front. It feeds into a 6-pin umbilical that goes to the truck. I had the factory add the wire, but I terminated it myself and added the 6-pin umbilical. It handles the brake feedback signal line to the truck that tells me when the Jeep brakes are on, as well as passes video signals from the camera(s) to the truck. o The optional rear hitch on the trailer was supposed to be reinforced for towing a 5000 lb vehicle. When it came time to do it I discovered that it did not need any reinforcement – what New Horizons puts on is pretty stout. Used a “home run” water manifold system. Each line is run from the manifold to its appropriate location. For any service work required you can isolate a single appliance. This is now standard on all Majestic’s. Dexter 8K disc brakes, 17.5” Goodyear H-rated G114 tires, 17’5” Alcoa aluminum rims (and spare), and Mor/Ryde IS suspension make up the running gear. The Mor/Ryde is standard on a Majestic. I could have put on air suspension, but I like the Mor/Ryde IS better. I have had it on three trailers now, and I think it is the finest suspension on the market. The 17.5" wheels with H rated tires are now standard on the larger rigs. We went with the standard 2-stage dual furnaces (two furnaces are standard on the larger rigs). We considered the hydronic heat/hot water package and decided against it. First, it is very expensive. Second, it takes up considerable storage space in the belly. And third, the new furnaces are so quiet on “stage 1” that you can barely hear them. On stage 2 they sound like regular RV furnaces, but we have only had them go to the higher output one time. And we have been in low teen weather conditions. The hydronic system provides outstanding heating, though. It is quiet and more “even” than standard RV furnaces. We made a compromise in not getting it, but are satisfied with the 2-stage furnaces. We also considered upgrading the water heater to a 16 gallon unit, from the standard 12 gallons. But we decided we had never had an issue with our 10 gallon heater in the Royals so we stayed with the standard unit. The way the 16 gallon water heater works is to raise the temperature of the 12 gallons in storage. On output (demand) it blends that hotter water with cold to supply 16 gallons of hot water. It only stores 12 gallons - but of super hot water. If we did it again I would seriously consider the RV 500 from http://www.precisiontemp.com/. This is a propane-fired instant hot water heater designed for RVs. It fits in a standard hot water heater space. The issue with the PrecisionTemp is that it does require more maintenance than a standard heater, people have more "issues" with them, and it costs considerably more. Batteries: 6xTrojan T105 batteries. We had the compartment door made larger for easier access (no charge for this). The larger door size is now standard. I considered using L16 batteries for more capacity in the same footprint. I would do that next time, but the price of the T105’s was too good to pass up. I can easily fit in 6xL16 batteries in the compartment. A Trimetric RV-2025 monitors the battery bank. Inverter is a Xantrex RS3000 3000 watt pure sine wave inverter. This is no longer available from Xantrex. I chose it for its 150 amp charge section. This allows me to charge the battery bank at a high rate for faster recharging on genset. If I was to order again, I would put in a Magnum 2000 or 2800 watt inverter, since the RS3000 is no longer available. Solar Controller is a Xantrex XW-SCC MPPT 60 amp controller. This networks with the inverter for a single-system controlled by the SCP panel. I installed this myself. New Horizons prewired with #4 welding cable. If using a Magnum inverter I would use a Morningstar MPPT 60-amp solar controller with its own remote panel. Instrumentation is via a Xantrex System Control Panel (SCP) which unifies control and monitoring of the the inverter and solar controller. I supplement this with the Trimetric battery monitor. If using the Magnum inverter in another rig I woudl specify the BMK (Battery Monitor Kit) along with the Magnum. This would eliminate the Trimetric and it shares the Magnum remote display so it eliminates a display from the instrument area. Solar panels will be from Sun Electronics (http://www.sunelec.com), 800+ watts. These will be 24-volt (nominal) panels. They have not been purchased yet. Generator is a 5500 watt Onan LP genset. This will run our two air conditioners if required and provide auxiliary battery charging. I considered both gasoline and diesel gensets. In the end, it was easier to go with the LP, since we simply do not use the genset much. If I did it over again I would seriously consider adding a diesel genset to my truck, which would have the added benefit of providing AC on the truck without running the engine. I did not tie the genset into the inverter system, although the Xantrex SCP (System Control Panel) does have a generator autostart capability. If I did add a genset to the truck it would be an Onan QuietDiesel (or an equivalent RV unit). The APUs (auxiliary power units) designed for trucks are too noisy and are harder to find service outlets for. There is virtually no difference in cost, even factoring in adding a min-split air conditioner for the truck. Note: I used the above equipment for specific reasons. That is NOT what I would recommend to others, and NOT what I would use if doing the same thing now. Contact me for my personal choices, or for help with your system. The Majestic comes standard with Quadra Bigfoot automatic biaxis leveling system. We would never have a rig without it (our Royals International also had Bigfoot). Quadra is our first choice for autolevelers. We had the Winegard Trav’ler HD model SK-3003 (DTV) auto dish installed and had all four output lines brought into the entertainment center. Normally, you would only use two for a DVR, but the extra two allow us to stack DVR’s, or serve as spare lines. A Wilson Electronics model 301119 cell phone antenna was installed on the roof over the coat closet area, with the antenna cable run through the roof into the communications area previously discussed. This connects to the amplifier and aircard/router and is dedicated to supporting Internet connections across the cellular data network. Also on the roof in the same area is a junction box for the solar line from the roof (#4 welding cable). This terminates the solar pre-wire line. In the future I would specify that the solar be terminated in a combiner box. They I would have a separate junction box on the roof with a 1.5" conduit going down into the top of the utility cabinet inside the front door. This would permit easy cabling of rooftop communication gear. The same junction box contains the cat5 Ethernet cable that feeds the roof for my WiFi capture CPE (Customer Premises Equipment) device. This allows me to pick up WiFi signals that otherwise are not usable, move them to my local router, and rebroadcast them on my local area network. Thus, WiFi-enabled devices around the RV can avail themselves of Internet that comes from RV Park WiFi, or from the cellular network without knowing the source. For more on our communications setup look in the Communications section of this website. We had the optional Scorpion protective coating applied to the lower front of the rig (it is like LineX) to protect it from stone chips. For me, this is a must-have. A gas line with shutoff valve was put into the center island. We will complete the plumbing on this for use with a Blue Flame propane space heater (used when we boondock only). A gas line with a quick connect was also put on the outside near the step for hooking up propane appliances outside. When you build a custom coach there are always things you would do differently “next time”, or things that you simply missed during the order process. The good thing about New Horizons is that they will work with you to add these things over time, if at all possible. The key is to get the structure and infrastructure items correct – other things can be changed more easily. We ordered the optional central vacuum system. We find that it works great on the hard floors (tile) but is not very good on the carpet. We prefer our Eureka Optima Lightweight Upright vacuum with the Pet option for the carpeted areas. This is the best RV vacuum we have owned – and we have been through at least 7 vacuums in the ten years we have been fulltimers. The central vac with its floor-kick pickup is great for sweeping the floors with a broom. But I am not sure it is worth the expense just for that. We should have added a kickplate electric outlet in the bathroom under the sink vanity next to the heater vent. We use a small ceramic electric heater in the bedroom year round. Not for heat, necessarily, but for “white noise” at night. The single plug on the side of the vanity requires us to unplug one device to use a hairdryer. An additional outlet dedicated to the heater would be more convenient. I should have had a 12-volt outlet put near the seating area for charging devices, and for use with a small inverter when boondocking (for charging phones, computers, etc). Although this is not the most efficient use of power, it is better than running the large inverter just for charging small devices. Actually, in the next rig I will add a dual inverter system –the large inverter for the entire house, and a small inverter that feeds a single outlet strip just for charging. The small inverter would have a remote control, like the large one. I can (and will) add this myself, later. If you never boondock, this is not an issue. Also, if you move to a residential refrigerator this would not be a factor, since your large inverter will be on all the time. 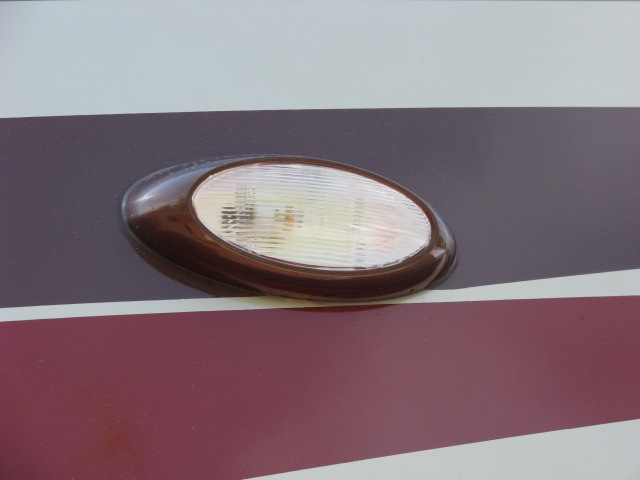 A side camera mounted on the front right side of the RV (viewing down the side) would help with blind-side backing, and vehicles in the blind spot. I should have had this installed at the factory, since it would have been painted to match the rig. It is easy for me to install myself – especially since I have the extra wires run to the nose of the trailer – but matching paint would be nice. The TV lift opening should have been specified for a larger TV. As it is, I can barely get a 40” on the lift. 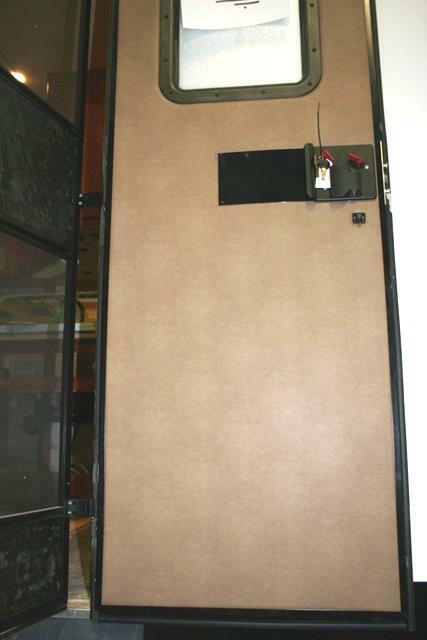 The lift itself can handle any size – the opening is constrained to 40”. A 46" TV would be the ideal size for this RV. Electrical outlets in the side cabinets of the entertainment center. I have some in the top cabinets where the various stereo/TV equipment is, but some additional outlets in the sides would be convenient. 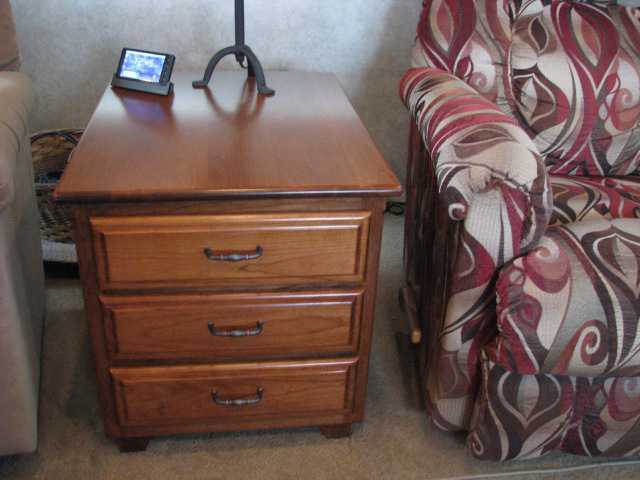 Custom end table with drawers between the two recliners – this is easy to add later. We replaced the cook top with a Verona stainless commercial cook top. I should have specified this to start with. My mistake. You can look at photos of that installation here. If I was doing it over, I would consider putting in the black glass-top gas Verona. I think it would be easier to clean than the stainless. But the stainless sure looks nice. I'd also consider putting in two separate 2-burner modules side-by-side with a mixture of gas and electric/induction. Take a look at the Subzero-Wolf 15" module system. I'd mix the induction and gas modules and inlay them into the countertop. This does require 240 volts for the induction, so it is only usable on 50-amp service. Thus the gas module. Is this expensive? Yes. But you are building a custom home. As I stated earlier – we should have made the couch area deeper. I would build the entire living area 1’ longer if I was doing it over. Six inches of that would be in the couch area, and the rest in the entertainment center. Light under the kitchen sink. It is a dark cavern. Now standard. We would delete the lift-up counter extension in the kitchen. We have not used it. With the island there is lots of countertop. If I DID keep the extension I would put it on the living room end of the island. We did consider doing this at the time, but opted for it on the kitchen sink end of the main counter. Where the three drawers are, to the right of the sink, I would remove them, and where the lift-top counter extension is now I would add three enclosed shelves on slides. Double doors would cover the area. This would provide far more usable space. The three drawers are very narrow. The alternative is to put the dishwasher drawer here, instead of where the oven would be. This would allow 3 large drawers in place of the oven. 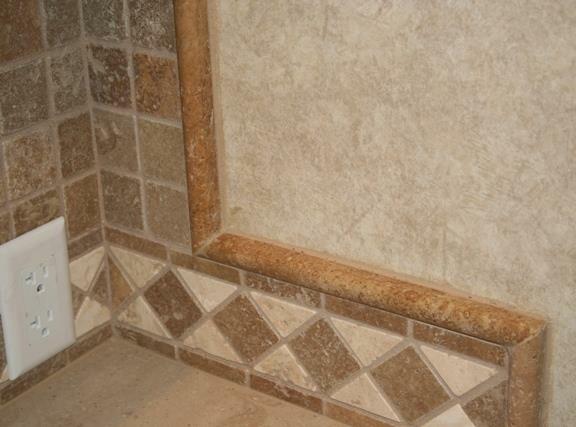 Extend the tumbled marble backsplash in the bathroom area along the cabinet side, instead of just on the back wall. I'm doing this myself. It is now standard. Add a second sewer storage tube. I did this myself. Make the sewer connection door wider for easier access. Add a second fresh water tank. We would do this for boondocking, but it is not necessary otherwise. I think I would plumb this separately with a “switchover valve” so you have to manually enable it into the system. The standard water tank is now 100 gallons instead of our 75 gallons. Add permanently mounted whole house filter system. We started with two filters that we place outside, which are convenient for filter element changes. I recently moved them into the utility area myself. The Hehr windows on this rig are very good. I would have liked to have had the flush-mount “frameless” bus-type windows that you see on Carriage and Doubletree products (also made by Hehr). However, at the time there were still too many issues with these windows. I now believe these windows are sufficiently “debugged” that I would use them on the next rig, and New Horizons will now put them in. They are now standard. Elevate the entry cabinet (coat closet) even with the first step to the bedroom. This provides space to kick off your shoes and push them under. They are out of the way if you have that space - otherwise they sit in front of the cabinet and block the door some. Build a separate water hose storage area to the left (front) of the sewer compartment. There is empty space between the skirt and the frame for this on larger rigs (over 39'). Add a small storage area into the sewer compartment for connecting tubes and elbows, and make the sewer door a little bigger. All RVs have issues with them. If you expect to get the “perfect” RV on delivery, you are going to be disappointed no matter who the manufacturer is. From a consumers perspective, the level of quality in RVs is notoriously bad if you look at the entire industry. The thing that distinguishes one manufacturer from another in the area of quality is 1) factory procedures that minimize quality issues 2) good final quality checks at the factory 3) Pre Delivery Inspections (PDI) that catch and correct issues before the consumer takes delivery 4) Post-delivery corrections under warranty. In the case of New Horizons and other “factory direct” manufacturers (like Spacecraft, Hitchhiker, Travel Units, etc) there is no dealer network for PDI and post delivery warranty work. Thus, the factory has to handle these items. From a manufacturing perspective, custom manufacturers have it even harder than pure production manufacturers. Every unit is different so it is difficult to establish good procedures because there is less repetition. Especially in small operations like New Horizons, and Spacecraft. Building a high-quality custom rig without excessive issues is a difficult problem. If you spend too much time on it, the cost becomes prohibitive. If you spend too little time, the quality suffers. Finding the correct balance is difficult. But as a consumer, I really don’t care about their problems – I just want a rig that is built correctly, and with materials that last – not with some of the junk that the RV industry is notorious for using. Fortunately, New Horizons has been building quality custom RVs for some time. So they do have a good bit of experience. And for the most part, they use higher quality materials than other manufacturers. But, like any RV, there are issues. The question is, what does the manufacturer offer for support, and what is their customer service attitude? New Horizons will fix any issues or oversights when you pick up the unit. - so allow enough time. You pick up your RV at the factory. This is a BIG (and I mean HUGE) advantage, even though you must travel to Kansas to do so. First, you get to see the factory and how your rig was built, if you have not already done so. Second – and this is the important one – you get factory service for any problems you find. No one is better qualified to service your RV than the people that built it. You are not likely to find a higher level of skill. You will find issues that the factory PDI did not find. Why is that? Well, you will live in the rig at the factory, and there are things that are difficult to find until you actually live in the rig. I recommend planning at least a full week for pickup. The best plan is to arrive on Friday for your walkthrough, spend the weekend in the rig examining it closely, and present your “punch list” on Monday. This gives you an entire work week to work out any issues, live in the rig, and become very familiar with things. It also gives you enough time to change minor things that you might not like or that you missed. Things like shelves can be easily changed if you have enough time. The very WORST thing you can do is to arrive at the factory for pickup and not leave enough time for proper orientation and fixes. There WILL be issues, and if you expect to leave in a hurry you will be frustrated, and not able to take advantage of service at the factory. So plan accordingly. New Horizons wants you to be totally satisfied with your rig when you leave. And if you schedule enough time you will be. Our 2010 was unit #8 in the Majestic line. This product line was built with many new design elements and parts from what the Summit line was. For example, the slides are totally different in the way they operate. The frame is new. The end caps and belly layout is different, etc. There are “growing pains” when producing any new line, and we knew that going into it. That said, our initial quality punch list was pretty small. Other than mistakes made by suppliers, we only had 11 items on the punch list. And most of those were minor. After living in the rig for eight months we had a longer list – which I expected to be the case. Again, most were minor, but there were a couple of major items. First, some of the slide seals were not quite right. Some of them needed replacing with larger ones. Not really surprising since the slides were a new design. We had air leakage around some of the seals, and some people had more serious water issues with these initial seals. The seals have all been changed to a better design, and for 2012 there is now an even better design. We had three window leaks. The windows needed to be reset. That was an issue that should not have occurred. There was a production issue that has been corrected. We had an issue with the rear cap not being sealed properly around the end-wall. An easy fix, but it should not have occurred. A loose floor tile (peeling up) in the toilet room needed to be re-glued. A minor issue. A loose tile UNDER the kitchen slide catches sometimes when the slide is pulled in. Since that initial loose tile we have had 3 others under the slide replaced. A piece of trim molding not aligned properly that I missed on the initial pickup. The kitchen counter puck lights failed – I thought the switch was bad, since they both died at once. Since we were headed for the factory I did not investigate. Embarrassingly (for me) the bulbs were burned out. There must have been a 12-volt surge. The polyurethane on the bottom bedroom step hazed over and needed correction. Turns out that it was never poly'ed. Bad pantry slide - it sometimes jams. This showed up after use. And it comes and goes....It turned out to be a slightly bent rail - an easy fix. We have a small leak in the window over the entertainment center. If only happens occasionally. It needs to be pulled and resealed. Either I'll do it, or the factory will in March. We have a small leak in the hydraulic manifold that controls the slides. This is in a plug for an unused port. I've torqued it as much as I'm willing too. The factory will fix it in March. The slide seal over the main slice has come off its mount. This will be fixed by replacing with the newer slide seals. I put it back on, but it really needs replacing to fix it right. Quality will continue to improve as the product line “matures”. But on average it is was pretty good as it was, in my opinion. The true mark of a manufacturer is in how they handle mistakes. Every manufacturer makes mistakes – hopefully not on MY unit. But mistakes do occur. We have friends that have a New Horizons Majestic (the unit after ours) where some mistakes were made in production. Way more than should have been. New Horizons absolutely stands behind their product, and there were no issues or questions about correcting things. Two years down the road from when our rig was built many things have changed at the factory. As you would expect. Quality coming off the line is now what I consider very good. And new in-house quality inspection procedures before customer delivery have proven to be very good at catching most remaining issues. But no matter how well quality control is performed it is unrealistic to expect a "perfect" rig on delivery. There will be things that you find - after all, the factory people do not actually live in the rig. In my opinion delivery quality can always be improved, and that is one area New Horizons works on constantly. For quality comments on our 2012 coach see the "Our 2012 New Horizons" section below. We often get the question of “how do you get your rig serviced if there are no dealers”? The answer is twofold. First, you can get an issue addressed by any certified RV technician at any dealership (or an independent mobile tech, as long as they are certified). New Horizons will pay the service provider directly, so there is no payment issue. New Horizons only asks that your provider work through them, so they can advise them on any model-specific things required. Second, and best, is to return to the factory for servicing. We much prefer coming to the factory, since obviously that is where the specific expertise on the rig is. But for routine servicing any technician can do it. You can see that we tow with an HDT (Heavy Duty Truck). You can read about HDTs elsewhere on this site. We feel it is the best choice for towing a heavy load, but there are other options. My suggestion is to not dismiss an HDT as your tow vehicle until you have all the facts. There is a video on "Tow Vehicle Considerations" that I did HERE. A New Horizons in the 39'+ category is going to be heavy. A heavy frame, all wood cabinets and quality residential appointments all add up. Light RVs are almost always "cheap" RVs. There is no getting over the fact that a quality rig, with residential appointments, is going to be heavy. You need a capable tow vehicle. 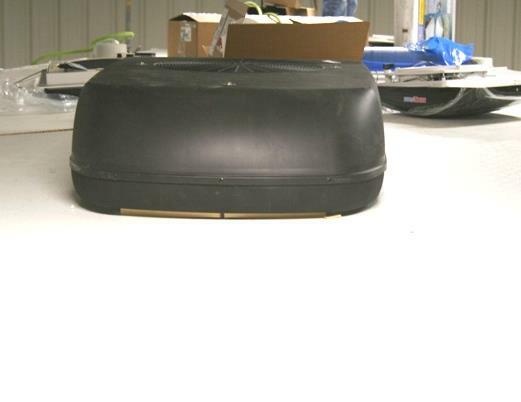 Our 42' New Horizons weighed 19,080 lbs EMPTY from the factory (and that was without furniture). Loaded with our "stuff" it was 22,820 lbs with 5700 lbs of that being pin weight. The GVWR on our trailer is 26,000 lbs. You are not pulling this with a pickup - at least not safely. You "could" pull our 2010 with an F450/550, but it would be maxed out. Our weights for both the 2010 and 2012 coach are in this spreadsheet. I have the unloaded weight ("naked" from the factory), as well as our fully loaded (full of "stuff") weights documented. 1) Upgraded pickups in the F450/F550 category. This includes the Chevy 5500-class trucks, but the 5500-type trucks are not rated high enough for most larger New Horizons, and they are no longer made. A 2011 or 2012 F450 is rated up to 33K lbs GCVW so it will pull most New Horizons. An F450 outfitted for fulltime use is going to weigh in the 9800-10,100 lb area, loaded to go. We know, because we used to have one. That would leave you no more than 23,000lbs for the trailer. In my opinion, pulling much over 21-22K lbs with even the newer and more capable F450 is marginal, at best, and is NOT RECOMMENDED. Although it is certainly within the trucks specifications. It is your decision. New Horizons can arrange a purchase of an F450 that is nicely equipped. In fact, they often have one of their pullers for sale. You "could" pull our trailer with a properly outfitted F450, but it would be near its max rating. You also need to be concerned with the GAWR of the rear axle with larger New Horizons. The pin weight may require you to go to an F550 for the more capable rear axle. The 2013 Dodge 3500 series can be configured to have a 37,000 lb GCWR. This should make a capable tow vehicle for heavier New Horizons. 2) A "true" MDT like a Freightliner M2. These typically have engines in the 300-350 hp range and up to 1000 lb/ft of torque. They have excellent brakes. They make a capable tow vehicle, but are slow on hills because of the low power. In many cases an F450 will pull as well - they just won't stop a load as well. The virtue of the MDT is that it is closer to a "pickup" in its looks and interior than an HDT. Most have 4 doors, and windows like a pickup. If interested in a new or used truck like this I strongly recommend that you discuss it with Wayland Long, the owner of 2L Custom Trucks in Poolville, TX. 3) An HDT. This is the most capable tow vehicle, with lots of pulling and stopping power. Most are taller at the floor than an MDT by about 11", so you have to "climb" into it more than the other trucks. Good grab rails and steps help a lot. In most cases it is actually easier to get into an HDT than an MDT. The biggest advantage of an HDT for many people is the ability to haul all the weight you want - including cars - on the deck. And the deck can be as large as you need. You can also outfit an HDT for extended travel as a motorhome, with refrigerator, bunks, cooking facilities, shore power, etc. A "mini-RV". Note that there are Freightliner M2s that are really HDTs....an M2-112 is actually a heavy duty truck, with up to 500+hp and 1800 lb/ft of torque. A very good alternative to an HDT with a sleeper if you want the 4-doors and windows. 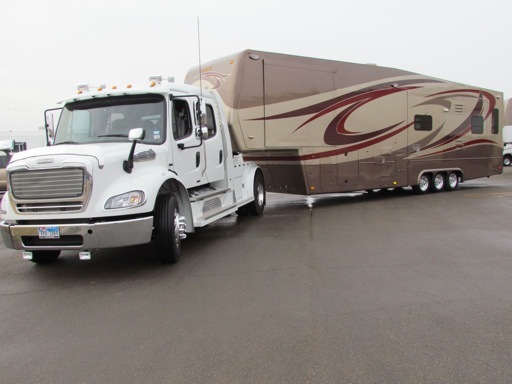 If you are looking for an HDT to haul with take a look at what Gregg Shields, from RV Haulers has in stock. My 2010 coach was 13' 4.5" at the front AC unit. That was with a Carrier low profile AC unit that is no longer available. With the Coleman low profile units my 2012 coach was 13' 5" when the coach was level, off the truck. On the truck it was 13'6.5". We later put on a newer Coleman Ultra low profile MACH 8 air conditioner. This brought the coach to 13' 2" when leveled off the truck, and 13' 3" on the truck. A very good solution. The MACH 8 is now standard on Majestic's in the bedroom/bath area. 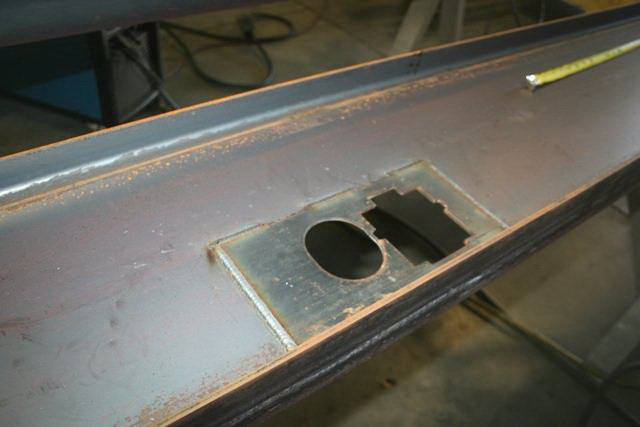 The Majestic hitch plate is 48" from the ground when the hitch is in the middle set of holes, with the coach leveled. Make sure you have the clearance required to your truck body with a hitch set like this. If you "recess" the hitch to its upper set of holes then the hitch plate will be 50" off the ground. Lowering the hitch head places it at 46" off the ground. Note that recessing the hitch all the way lowers the front skirt of the coach very low to the ground unless you maintain level. So don't be tempted to lower the overall height of the coach by simply dropping the front. The Majestic has adequate ground clearance in the center hole set when leveled, but the more you (effectively) lower the skirts by recessing the hitch the more you risk hitting in the front - you need to maintain a level coach, so the hitch in the truck has to be the appropriate height to do so. Maintaining ground clearance at the front skirt of the coach is especially an issue with HDTs or MDTs where the hitch may be behind the center line of the axle. 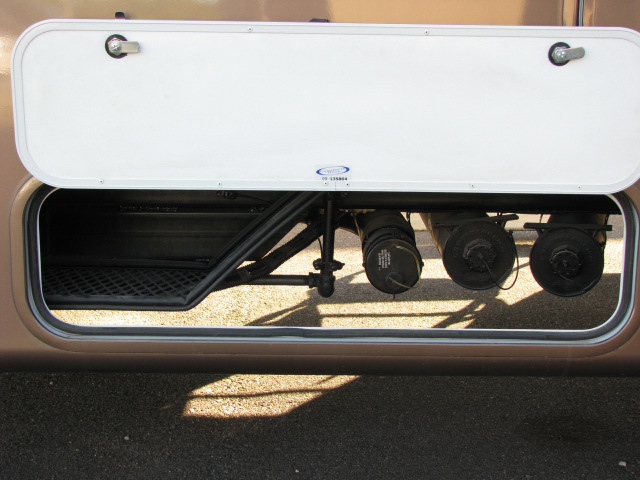 Having the hitch behind the axle amplifies the movement of the trailer front towards the ground when traversing dips. One of the issues with using an F450 as a tow vehicle is body side clearance. The side rails on an F450 - and most pickup-style trucks - are pretty high. You can end up with only 5" or less clearance between the truck and trailer. I strongly advise that you measure carefully. Or better yet, if towing with an F450 specify a hauler body on it. I personally like the Utility Bodywerks beds. It gives you lots of storage, lots of clearance, and looks great. Many people have asked about what we have changed in the 2012 rig. Many have asked why we built another coach, as well. First - the only reason we built another coach is because we show the RV, on behalf of New Horizons, to prospective customers. We show this coach a lot. We attend Rallies with it, and show it in RV parks around the country. As such, it is beneficial to New Horizons, prospective customers, and (obviously) to us that we have a fairly current RV to show. Who wants to see an RV without the most "current" features? This section will list some of the things that are different in our 2012 RV over the 2010. It focuses on non-standard features. You can assume that all of the changes noted in the 2012 features are in this unit. Look at that section, above - I'm not going to repeat it here. Basically, the floor plan is the same. We prefer the side entertainment center for a number of reasons. Foremost because the TV is directly in front of our recliners, at the right height, and you do not have to twist sideways or look "up". This is the primary motivation for the living room floor plan we chose. The only change in the basic floor plan over the drawings shown for the 2010 unit is that we extended the overall length six inches. We added three inches to the sofa area, which gives a 41" usable depth for a sofa, and we added three inches of width to the refrigerator "box" which allows for a residential counter depth refrigerator (39" box, outside, wall-to-wall). We also put in a 30" wide entry door, which caused the slide to shift. 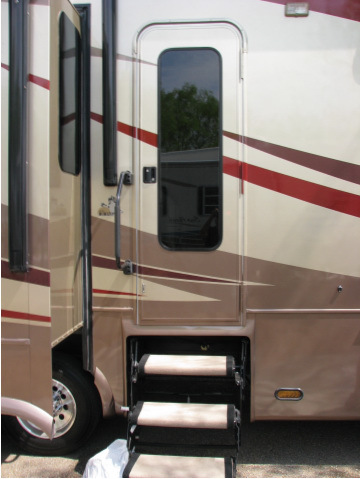 The three inches in the refrigerator "box" is reflected in the curb slide and allows that to remain the same size as in the 2010 RV. If we had not added three inches the wider door would have taken away from the slide length. There has to be enough outside wall space to mount the handrail and awning arm, and more importantly, there has to be enough width for the slide room framing. Adding a wider door complicates layout. There are even wider doors available, but the 30" door is sufficient. Putting in a 32" or 36" door requires an even longer unit. The issue is the location of the axles. They have to be positioned to achieve a 20% (or so) pin weight. And they can not be under the door. Shaw hand-scraped hickory engineered wood floor everywhere except bedroom carpet area, and curb slide carpet area. I was told by some that we will regret this because it shows dust and dirt easier. To me, that just makes it easier to clean up....but we will see. We have an area rug in the living area. After living with it for several months we really like the wood floors - they are so much easier to keep nice. Our next unit will have them too. Residential refrigerator. We chose a counter depth Frigidaire Gallery Series FGTC2349KS, 23 cf with water and ice in door. This is a side-by-side and it uses 550 kWh of power a year. We originally set out for a bottom freezer with French doors above, but this unit gave us slightly more space in the same footprint, and does not look as large. A good alternative is the GE Profile PFIC1NFZ 21 cf. It uses 571 kWh a year. Both of these units are counter depth and are panel-kit ready. The panel kit was a major consideration. In our chosen floor plan we have the refrigerator (visually) somewhat in front of one of the recliners. Having a panel kit integrates it better into the cabinetry - you do not want to be staring at stainless steel (as an example). Battery bank is four 8D Lifeline AGMs for a total of 1020 Ah of battery storage. Usable is 510 Ah. Magnum 2800 pure sine wave inverter with 125A charge section and integrated battery monitor (BMK), along with the remote display. The Magnum is great - the BMK, not so much. I've installed many of the BMKs and configured them, but this is the first I have personally owned. I have to say, I like the TriMetric a lot more than the BMK. Morningstar Tristar MPPT 60 solar controller with remote display. Both the solar controller and inverter/charger are temperature compensated, and the Morningstar also has a voltage sense line and an Ethernet line connecting it to my router for PC monitoring of the solar array performance (although to date I have not set configured this remote monitoring to the PC). MidNite Solar "baby" breaker box is used with the solar controller to isolate it when required. AM Solar combiner box on the roof. Sun SV-T-205 HV solar panels. These are 205 watts, 27.90 Vmp, 7.36 Imp, high voltage poly-crystalline panels. Four of them give me 820 watts of power. In practice it will be less than that, since they are mounted flat, without a tilt capability. This maxes out the controller. Installed by New Horizons. Note: these panels are large and are slightly shaded by the front AC unit in some parking directions. So that has to be accommodated for when parking the rig boondocking. The tradeoff is to have less panel capacity. I'd rather "manage" the orientation of the rig. We moved the 5500 watt LP genset from the 2010 coach. Ceiling lighting is all LED. This is dimmable via the multiplex light controls. Lazy Boy furniture. We started with two Larson recliners and one Larson love seat (like two recliners together) that is a rocker/recliner. The Larson recliners turned out to be a mistake. The Larson furniture is rather large - we replaced it with leather euro-style recliners that fit us well, yet appear smaller in the room. I also do not need a footstool, since my new recliner is large enough. The Lazy Boy Pinnacle style is the right size, and what we had in the 2010. The Larson loveseat works fine in the bay window area. The entertainment center cabinetry is almost identical, and adding the 6" to the overall unit allowed us to keep it the same size. The only difference is that the top/left file cabinet is now two drawers instead of a file cabinet. The other three file cabinets that flank the fireplace remain. The TV is upgraded to a Samsung LED 40". The standard TV is an LCD 40". I also had the lift door sized for a 50" TV so I can upgrade later if "allowed". The surround sound system was upgraded to a Denon A/V receiver with Boston Acoustic speakers - we are experimenting on this unit with a new set of components and speakers that may replace the current Samsung's used as standard. (The Denon has since become the standard AV receiver.) Blu-ray DVD. The Boston Acoustic speakers are quite good, but the center channel could be improved. Each of the overhead compartments in the entertainment center has shelves and an outlet. Larger sewage storage door, with area for storage of components. Two hose storage tubes instead of one, sewer macerator. 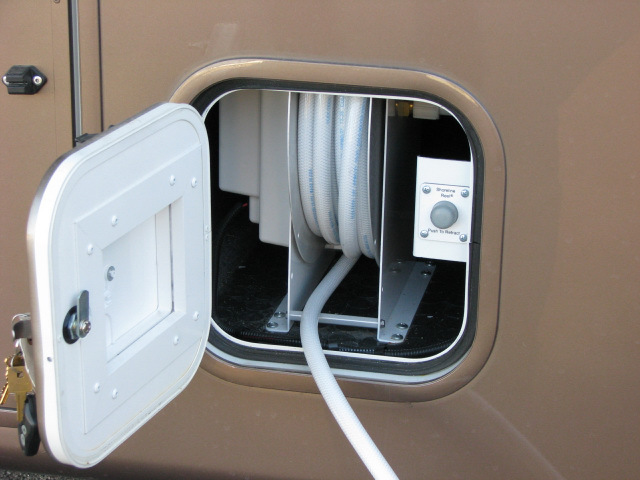 Extra outside electrical outlet near propane tanks, for plugging the truck into (120v/20A). Reverse osmosis water with 3 gallons of storage under kitchen sink. This supplies the refrigerator, and the countertop water dispenser. It also has a DC line there for a future auxiliary DC pump if required to supply higher pressure water for the RO unit. RO units work best on more than 40 psi. This has proven to be a great addition - much better water than just filtered. We would definitely do this again. Cook top is the (now) standard black Verona 4-burner unit on top of the counter. Done over, I would change this to the glass top gas unit, also Verona. It is easy to clean (far better than stainless) but the glass would be even better. Take a look at the 30" GE Profile gas/glass cooktop. It is a nice unit, but the larger size is a consideration unless you stretch the kitchen in that area. Storage under the Verona is two doors (French opening) with a shelf. Standard is two drawers. The shelf makes better use of the space and allows for more flexible space usage. Dishwasher is in the new standard location, with one drawer above it. Wine rack is replaced with a small cabinet with door. Center island trash storage is converted to a shelf. Upper drawers are reworked to one large drawer (two small ones combined), and one additional small drawer next to the large one. This "new" drawer uses the space above the trash can area. Drawers open towards the street-side. Trash can is under sink. Sink is a Swanstone Ascend undermount quartz sink in Espresso (dark brown). If you have a dishwasher you might consider a smaller (25") sink. We used the same oiled bronze Delta High Rise faucet, model 19949-DST as the 2010 - mounted without the plate, and with the soap dispenser. Lighting in the kitchen has been modified. Starting with our unit the new lighting will incorporate standard pendant lights over the island, and an extra 12-volt "puck" light in the ceiling over the kitchen area. The 120v "bright as day" fluorescent fixture will be eliminated in coaches with an island. An example of the pendant lights is in the New Stuff, below. The pendants mount on a cherry medallion on the ceiling. Our vanity area is quite a bit different. It is as shown below in the vanity picture (New Stuff). It is the second picture with the extended medicine cabinet and the full width counter. We eliminated the closet we had in this location. We still have three drawers below (we had 5), but I lost all "my" shelf space above. In reality I have plenty of space elsewhere. We pushed the cabinet back 2" in the toilet room. It gives a little more space in front of the toilet, and allows the toilet room door to be widened 2". We added 9"deep shelves to the left side of the wardrobe. I store stuff here that I don't wear often....I consider it "long term" storage. The entry closet is raised 6" for shoe storage - otherwise known as a "shoe garage". You can not do this if you choose the whole-house vacuum option which needs to be placed in the base of the entry cabinet. The instrument center is moved to the upper cabinet. 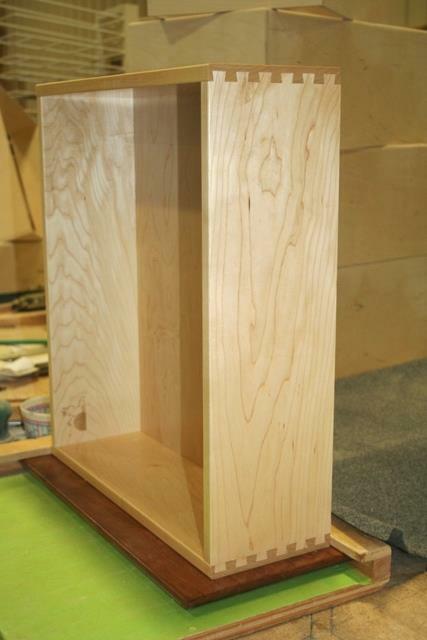 The lower cabinet is already raised the 6" for the shoe storage, and we made it slightly smaller than the upper. Thus the instruments are not really that much higher. This is standard now. We have a rough in for a third AC unit that would take the place of the MaxAir fan in the living room. This is ducted, wired, and thermostat wire run. All "prepped" for the AC, should we ever desire it. There is a 1.5" conduit through the roof into the utility closet at the front door, then down into the main compartment. On the roof it terminates in a utility box. I use it to route electronic gear cabling to the roof. Porch light is replaced by a "scare light", and centered over front door. Now standard. Steps are three steps instead of four. These are upgraded aluminum steps that are powder coated, with deeper treads. We use a portable step for the bottom step. This allows us to adapt for uneven ground, and/or a deck. These aluminum steps are quite nice - but the tread depth is shallow, and that is a compromise. Consider carefully if that would work for you. I like the maintenance-free steps...but I might reconsider next time and put in the three-step version of the steps with deeper treads. We added a right-side camera to the RV. It will help significantly during blind-side backing. We added cherry baseboard throughout the coach (2013 feature) and a chair rail in the living room. Many people know that I am critical of the RV industry for the quality of the units produced, and the components utilized. Some think I am being unfair, but my perspective is that if a manufacturer is producing a "big ticket" item it should be well constructed and utilize quality components. Especially in higher-priced units intended for fulltiming. Unfortunately, in general, the RV industry still produces what I consider to be "marginal" products. Fit and finish, and the basic building materials used, are often nowhere near reasonable standards for the price charged. It is also true that carrying capacities and the running gear used is marginal, resulting in breakdowns and serious damage in many cases. New Horizons attempts to use quality components and to assemble their custom units well above the typical RV industry "standards". Our 2010 (unit #8) was pretty good, and things improved radically after our unit - as you might expect from a company that prides itself on "continuous improvement". There were so many nice touches and improved components added to the product line in two years that we felt it was worth the upgrade to our 2012. So how did New Horizons do, quality wise, with the 2012? Well, amazingly well - they actually exceeded our expectations. I have to say, that I am very impressed with the "final finish" section of the production line. The newer employees bring skills and an attitude to production that were lacking in the past, and make a HUGE difference in the final product. This is continuous improvement at its best, in my opinion. Our 2010 unit was very well done - but the 2012 is a level above that. The fit and finish in this coach is well above anything else I've seen in the (towable) RV industry. And in my opinion it is because not only does production management "care" about it, but the line employees are highly skilled and take pride in their work. They WANT to satisfy customers, and they do. Now, this is not to say that mistakes do not get made - they do, and will, in any production environment - especially on totally custom RV's. But these are minimal, and they work diligently to improve the process. My list of issues was very small, and I'm a pretty demanding customer. So, what were our issues with the 2012? You can see what we presented to the factory on pickup - but note that most of this "punch list" is really things we asked to be changed or added - not really problems. But it should give you an idea of what happens on pickup, and why we recommend that you allocate a minimum of a full working week to pick up your new unit. I have not edited or changed this list - it is exactly what I presented to the factory. Punch list. Change is continuous. We always find things that can be improved, or that we would change because our needs change, or additional products come to the market. I'm going to use this section to record our thoughts on our "next" coach. Will there be a "next one" soon? Well, as long as we have the relationship that we currently have with New Horizons the answer is likely "yes". In fact, I anticipate selling the 2012 coach we are currently in sometime in 2013/early 2014 and shifting to a new coach. One thing we will do differently - we will NOT build a new coach until this one is sold first. So if you are interested, we can arrange the "opportunity" to buy a very customized and up-fitted coach at a very good price - way below actual retail selling price. In no particular order, these are our ongoing thoughts. They may change over time, so take this list with a "grain of salt". The 2012 coach is 42' 6" - the next coach will be 43', or 44'. We will add an additional 6" into the main slide and entertainment center. This will enable the chairs to slide "down" a little for better positioning. They are fine as they are now, but the additional 6" in the entertainment center will allow for a 55" TV and the chair positioning is a side-benefit. We may also add 6" into the kitchen area so we can use a 30" residential glass/glass cooktop. Right now I like the GE Profile line. I'd like to work a layout where the refrigerator is in front of the entry door and the pantry is next to the stove. That may require a longer unit. We will see. In the end, I may not like this but at the moment it is the direction we are heading. The only motivation for this is appearance - we think it will be better to have the pantry where the refrigerator is now. We think we have the upper deck (bed/bath) perfect for us, given the current options. But for resale we may change the toilet room from a closet replacing the sink, to the standard sink with a larger cabinet above it. Many people like the sink in there....for us, we would rather have the closet storage. But we may be able to accommodate both. I'd like to see a shower that used a preformed pan and then the walls are Corian/Silestone/artificial marble, with tile inlays. I think this makes for a nicer shower more in line with the rest of the residential look of the coach. I'll probably do this in the next unit if it does not become an option or standard. It will add cost to the coach because of the time required to install it, and the additional material costs. For sure we will have a gas cook top with a glass top. We may put in two modules, one electric, one gas. And it may be the 30" GE Profile referenced above. Side by side residential refrigerator will go back in. Probably a newer model than we have, but the same concept. The residential refrigerator has worked out well even boondocking. In my opinion all coaches should now be using a residential refrigerator. We will do a "motorhome style" dining table layout. This has shallow cabinets along the wall, with a table cantilevered from it, instead of the current freestanding table. We might even create a side-by-side eating area where we sit looking out the window. For resale this would be easily modified to the cantilevered table layout. We may add this to our 2012. Water: I'd consider putting an extra 100 gallon tank on. I'd use this for spare water and/or for RO water storage. Our RO system is great, but we are working off a 3 gallon tank for drinking water only. I'd seriously consider running off internal RO water for everything, not just drinking water. I highly recommend the RO system, even if it is just for drinking. I'd also add the electric water hose reel with 5/8" hose on it. With the new utility layout (for 2013) this would work well. I would like a single main plenum AC system. Right now the system is split - bedroom/living room. A common main plenum is a better design. There are layout problems in the roof that cause issues doing this - mainly the fact that the skylight in the bath prevents return air ducting layout. This is likely to be an upgrade before our next rig, but if not, I'll sacrifice the skylight to get it. I'll add a "light tube" in the bath area for natural light. We do not need the additional head clearance the skylight provides in the shower. Upgrade to the 16 gallon hot water heater. We have enough hot water with the 12 gallon system, but the 16 would be better. I'm tempted by the continuous hot water systems, but I still hear of too many issues with pressure vs. volume with them. That likely will change in two years time, though. Electric under floor heat in specific areas. Namely the main bath "hallway", the living room space between the fireplace and chairs, and just in front of the landing/entry door area. The Shaw wood flooring is designed to accommodate this. These will all have separate thermostats. Custom built end tables with storage flanking the couch area. A smaller version of what we have between the current chairs. I just have to convince New Horizons that they "want" to build them. 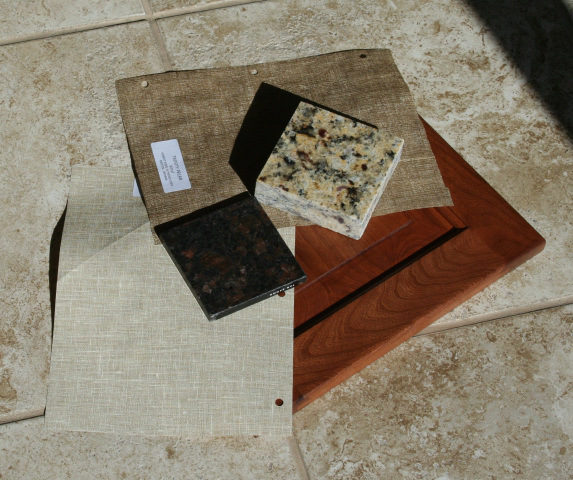 We will have granite in the next coach (see the 2013 features section), but I will change the tile backsplashes to a custom tile that we pick. I may substitute quartz for the granite on the just the kitchen counters - granite elsewhere. A storage compartment behind the dining slide at the rear of the coach. This is currently wasted space. Maybe an infrared panel heater on the wall in the bath, between the toilet room door and the washer/dryer doors. This will be wired to the main panel, not the inverter panel. In addition, the lower electric outlet in the bath vanity will be on its own circuit on the main panel. We use this for an electric heater. Things constantly change in the standard appointments, and the way things are done. New Horizons strives to constantly improve the quality and engineering in their rigs. I'll include "some" of the changes in this section. I'll also include some of the interesting modifications people make that I can get pictures of. These changes started with the 2010 coaches, and are a running commentary - many of these elements have been incorporated into the standard product, or are options. Most of the pictures below are thumbnails. Click to expand. They open in their own windows so you can put them side-by-side to compare them. One of the things we disliked in our 2010 coach was the way the electric wires were retained under the slides. The new method encloses the wiring in tubes. This completely protects them and makes the entire under-slide area much neater. The tube moves in/out with the slide. The photo shows a hole blown through the frame - this was the prototype installation. These holes are now reinforced with a welded plate like you see with the slide arm. The reinforcing plate has a neater hole in it. The "new" stairs (starting in 2011) have deeper tread depths. It makes navigating up and down to the bed/bath much easier. The first picture shows the standard vinyl tiles that we have in our 2010 coach. The second picture shows stairs built with custom distressed Hickory flooring. In this coach the flooring covers all the main living area and the bath area. Also, look at how the coat closet is elevated above the floor, leaving an area to put your shoes if you remove them when coming in. That was our suggestion, and we incorporated it into our 2012 coach. It keeps the shoes "mostly" our of the way. On the far left is the "normal" vanity treatment for a larger bedroom unit. 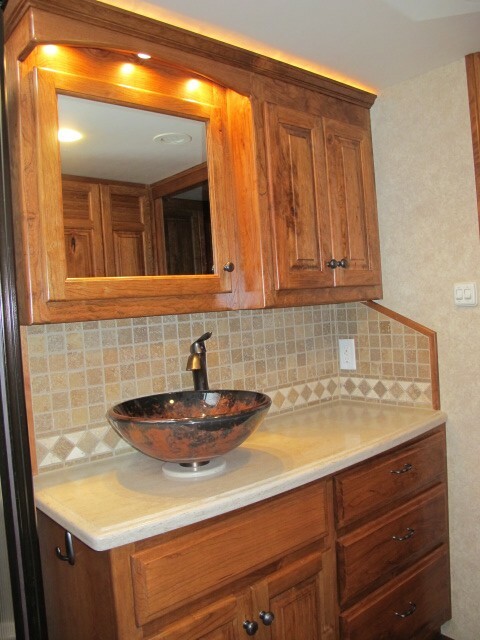 Our 2010 coach would have looked like this if we had not added the cabinet next to the vanity. We lost the large drawers and upper medicine cabinet area. There is a lot of vanity top here and it is very nice. Note the wood floor continuing in the bath area. On the near left is a modification of the standard vanity area we like a lot. The right-side medicine cabinet area is basically doubled in depth and the lights shortened accordingly. This looks pleasing and gives you more storage without building a large cabinet like we have. You retain use of the countertop which we sacrificed. In this case there are pocket doors separating the bath from the bedroom area, but you could have it open to the bedroom if you did not want the pocket doors there. This will be a 2013 standard feature. While we are on the topic of bath vanities - here is a customization of the small vanity in the toilet room. Note that the lower area is recessed in, to allow additional "knee room" on the toilet (which you can just see in t the lower right portion of the picture. In this instance, the toilet paper holder is also inside on the door of the cabinet. New outside "scare" lights. Note they are painted to match the body color. These oval ones look nicer than our round ones. I would specify this for the porch light - they look nicer and put out far more light - and I would place it in the center over the door opening instead of off to the side. That way it lights the step area from above better. This is the main storage compartment of a 45' unit. There is really a lot of space here. It is 44" tall. There are two doors to access this space on the passenger side of the rig. This is the same unit shown in the (left) "bath" shot above. It is 45' long. There are pendant lamps over the center island. These work well, and have proven to be no issue during travel. They do move some, but nothing "bad" has happened to them. These are now standard. Also note the Verona cooktop. You can see ours and how we added it in our Verona Picasa Album. 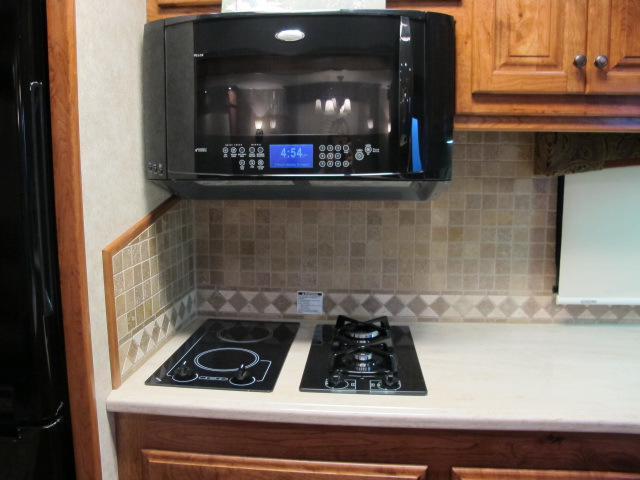 This unit has two 2-burner cooktop modules that I discussed earlier. The left one is a 2-burner induction cooktop. The right one is a 2-burner gas cooktop. In this case they are both from Verona in black. You would only be able to effectively use the induction module on 50 amp electric service. In our case, we are usually on 50 amp service, so it is something to consider. You can also place these modules touching each other with a trim strip. This door looks great. It is a frameless window design, like the optional frameless windows. The entire glass area pops out from the bottom, just like a pop-out window. Like a window, there is a screen inside, directly behind the window glass. There are several things I don't like about this door. First, there is no other screen door, so you can not leave the door open. Second, if the window is open and the door is then opened all the way, the window will hit the side wall of the RV. It will either break the glass over time, or damage the paint. Third, there is not interior shade on this door, so at night you can see inside. Consider carefully if this is the door you want - it is an option. It sure looks nice, though. This shows the new "frameless" windows now available on the Majestic. They are the same Hehr windows that are used on DRV, Carriage, Spacecraft and other units. They look wonderful and work well. On this unit there are fixed (non-opening) frameless windows in most of the slide ends. You do not want a pop-out window open if you retract the slides. One thing I do not care for on the picture shown is that the windows are "shorter" than the standard Hehr windows on a Majestic. Normally, the windows come almost to the "shelf" of the endcap. It makes a big difference inside - especially in the main slide. (Not so much in the endcap, where the sofa blocks the windows some anyway.) I would want taller frameless windows, but that requires a tooling fee for the special size. Once someone springs for that, the taller windows will be available. New: the taller frameless windows are now a reality, and are standard. They are a longer version than shown here. The framed window is a a no-charge option. This is a dishwasher drawer in the end of the counter to the right of the sink. In my opinion it is the best place for a dishwasher. Ours is under the cooktop where the oven would be, but this is a far better location. It is closer to the sink, and uses an area that is not otherwise optimally used. There is space for a drawer above the dishwasher, although in this particular installation there are no drawers. If you place the dishwasher here, there is room for two or three very large drawers under the cooktop where the oven would be, or, you could have an oven. In our case, instead of drawers under the cooktop we would have two doors (opening to the sides) with an adjustable shelve in the cabinet. 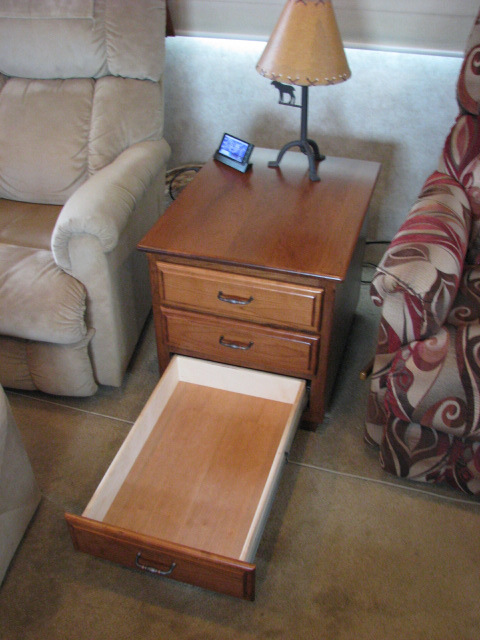 This would maximize usable space - you lose a lot of space with drawers, but sometimes they are more convenient. 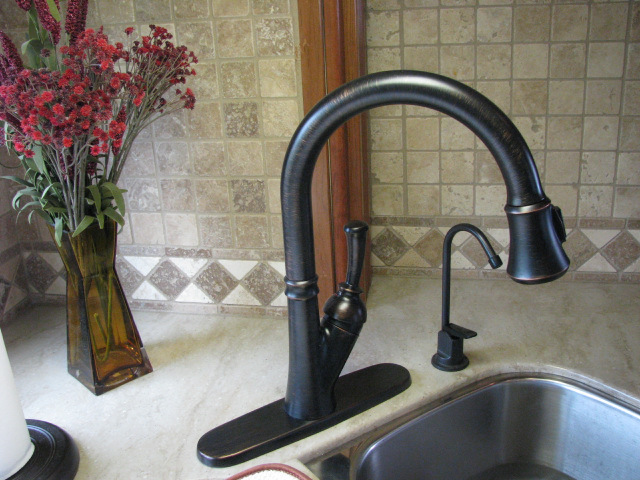 We replaced the standard faucet with an oiled bronze Delta High Rise faucet, model 19949-DST. This has a high pot faucet, removable spray assembly, and a diamond-embedded ceramic cartridge for maximum lifetime. This faucet is available from Lowes (but not Home Depot). Take a look at it here. It also has a magnetic docking rim for the removable spout. The standard faucet has been upgraded to a Moen version that looks similar to this one. We prefer the Delta because of some of its technical attributes. Instead of the standard stainless sink our 2012 New Horizons will have a Swanstone Ascend undermount sink in Expresso. It will have the faucet shown above, without the plate, and a soap dispenser and reverse osmosis water drinking water dispenser that also feed the refrigerator icemaker/water dispenser. We had a custom end table made to sit between the recliners. There are three 24" deep drawers that can hold laptop computers, remote controls and office supplies. The table is cherry to match the rest of the interior woodwork. A very nice addition, but obviously pricey. This is a true piece of custom furniture. You can get a powered water reel that is similar to the power cord reel. It comes in 50' and 75' lengths. It uses 1/2" water hose, which is adequate but cuts down on flow slightly. Remember, your interior water lines are all 1/2". You can substitute 5/8" line but it reduces the length of the line. Here is my preferred sewer compartment - at least the current version of it. It has an extra sewer hose storage tube, and a place for storing "black" elbows and connectors away from "clean" areas. Something like this is likely to be standard in the 2013 models. I write a technical article for inclusion in the New Horizons Newsletter - usually on a bi-monthly basis. For those interested, the following articles have been included in the Newsletter. These are mostly the unedited versions, and may differ slightly from what was published. You may find the complete Newsletter on the New Horizons website.